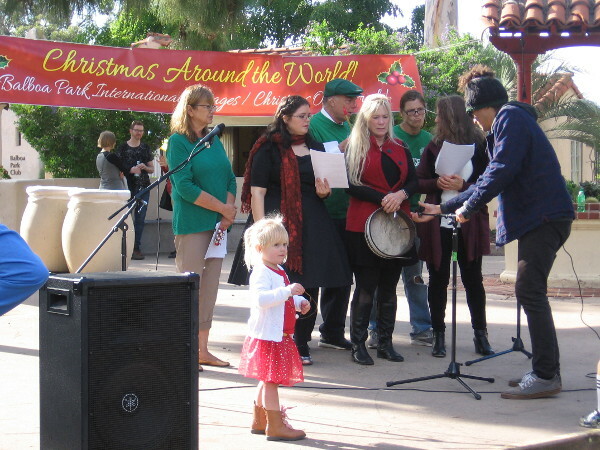 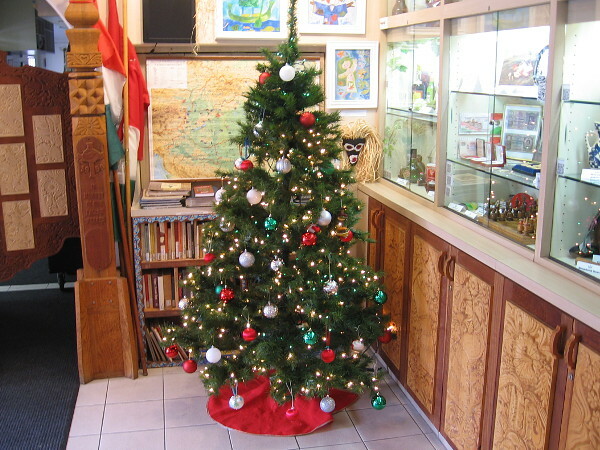 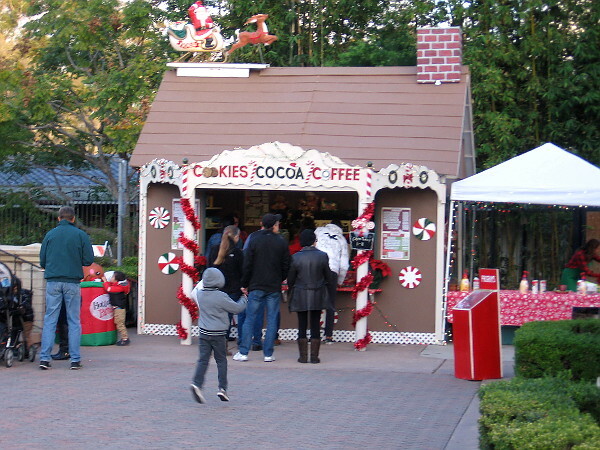 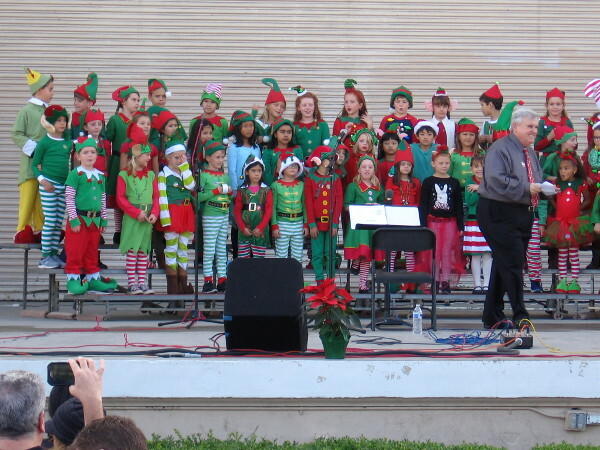 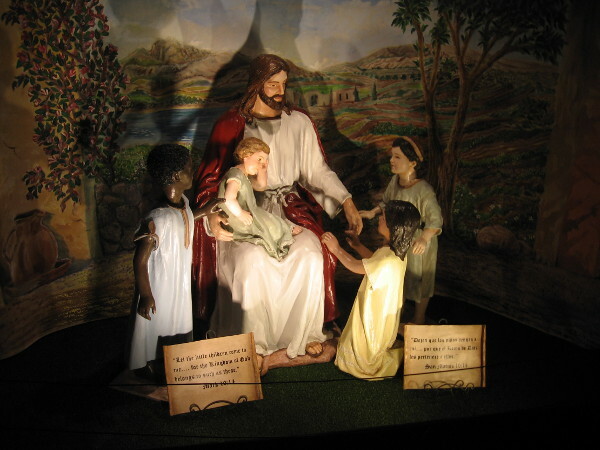 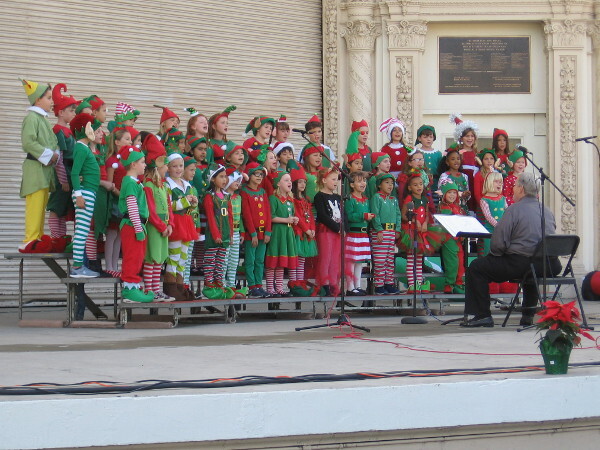 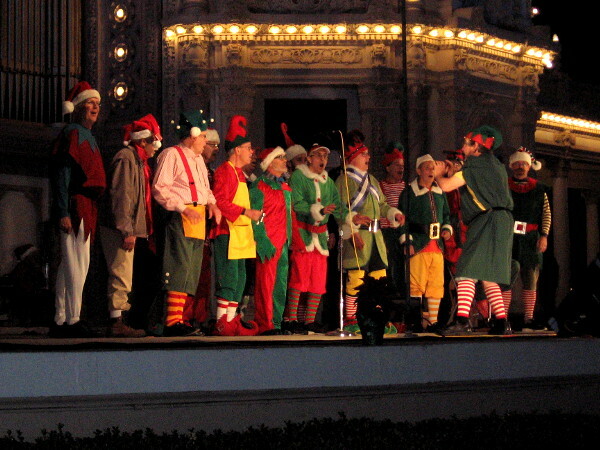 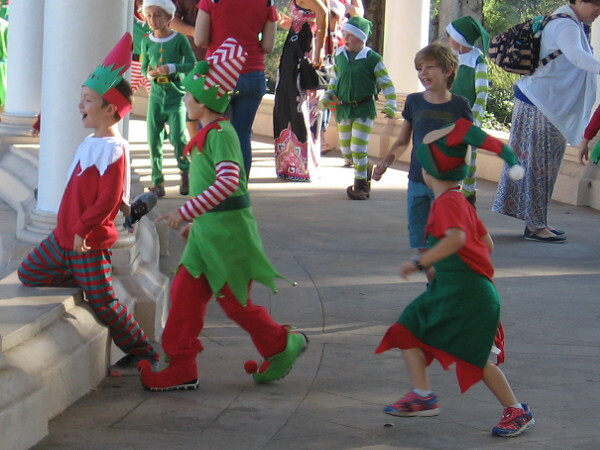 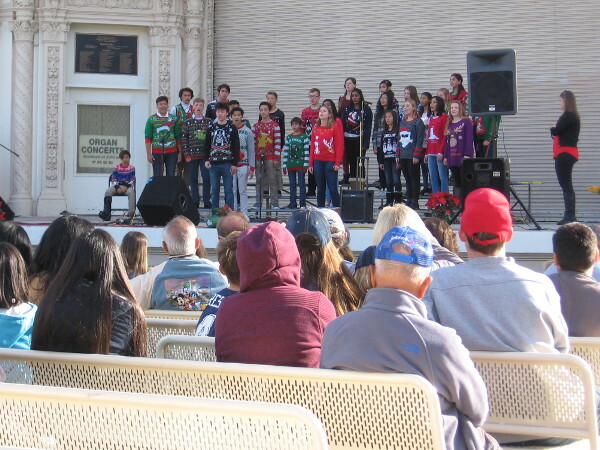 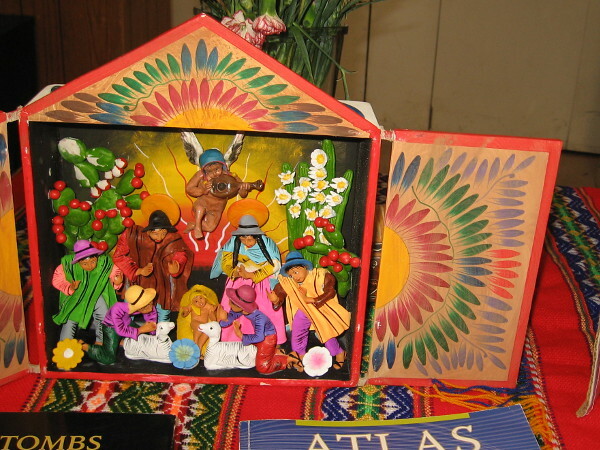 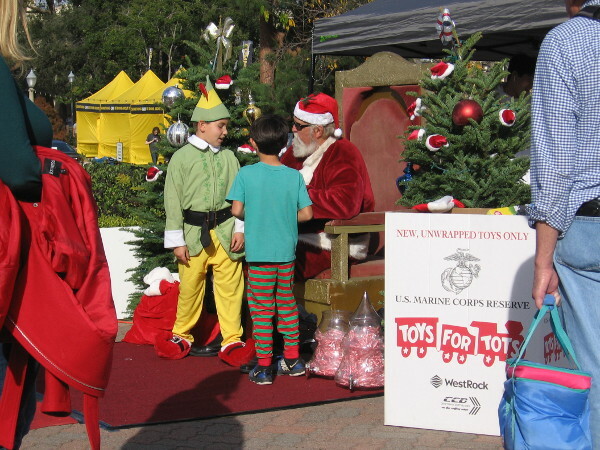 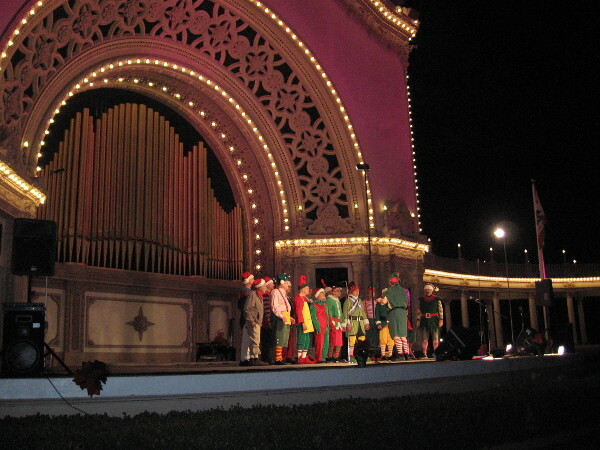 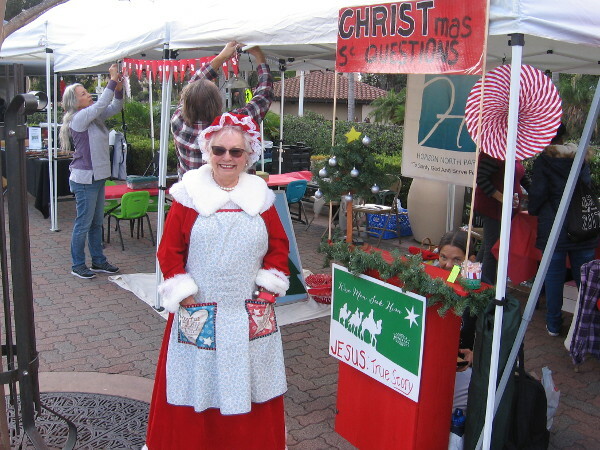 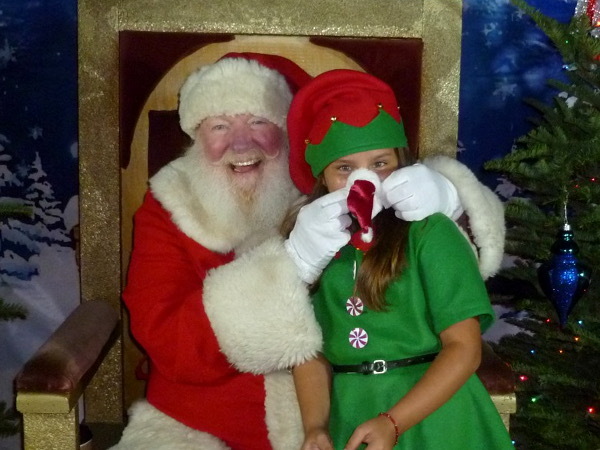 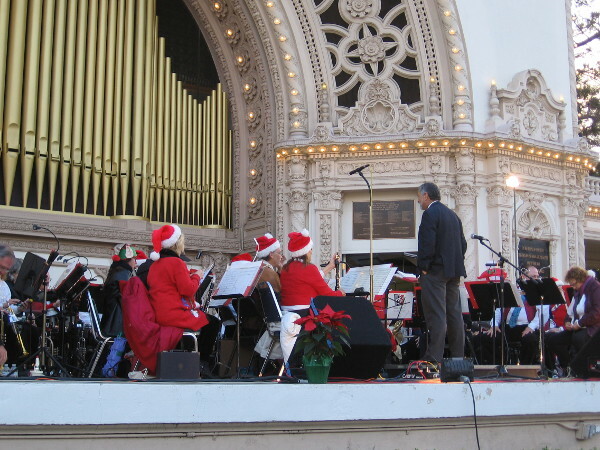 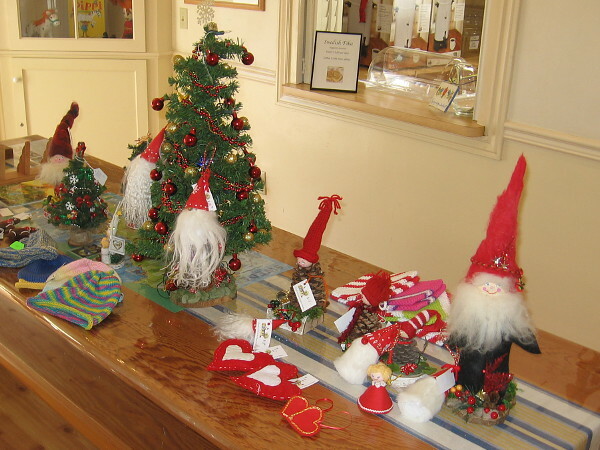 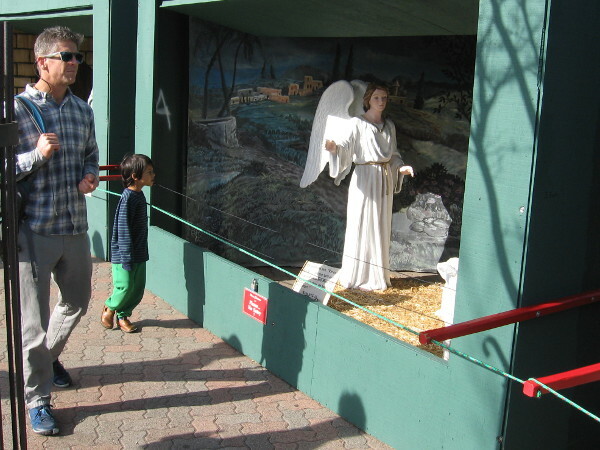 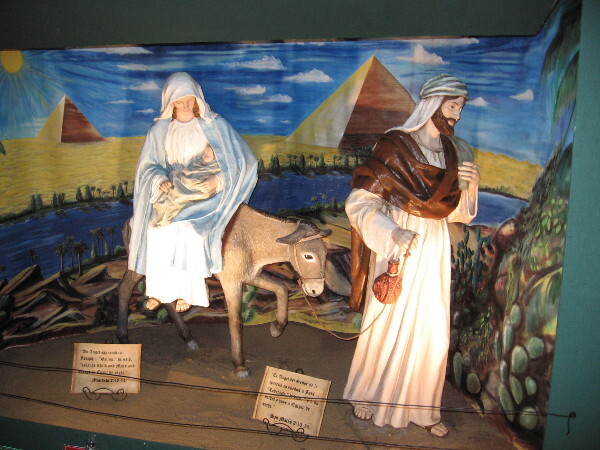 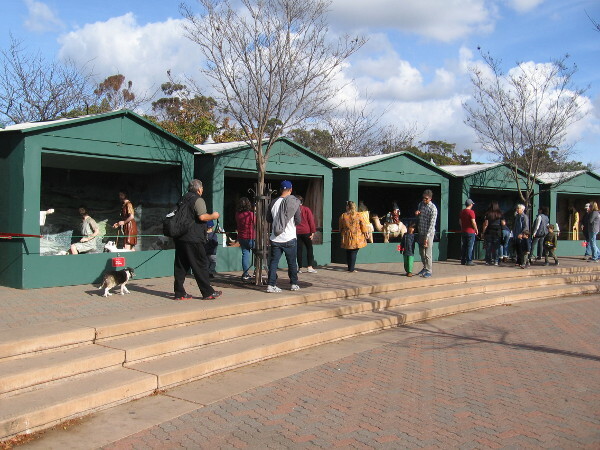 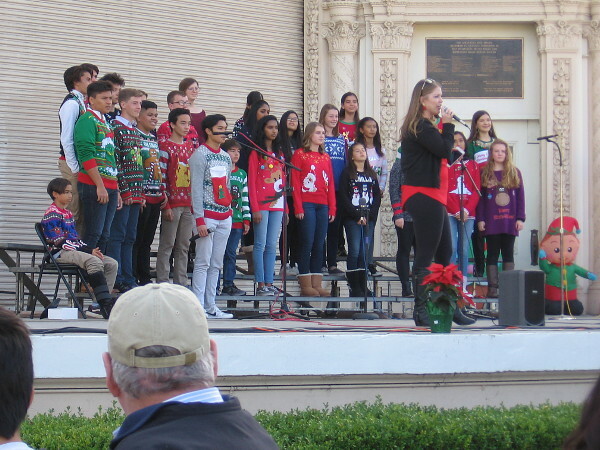 children – Cool San Diego Sights! 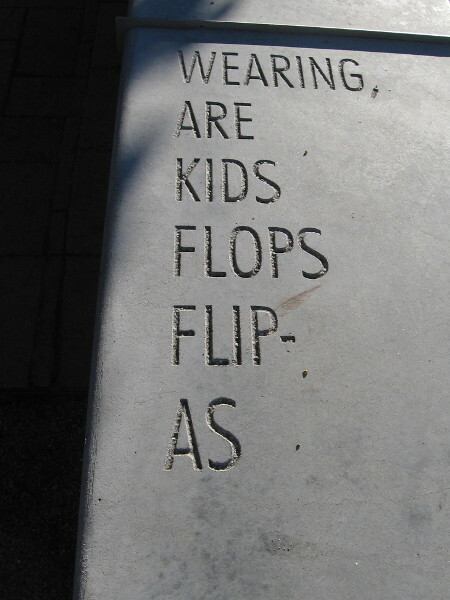 Surprising wisdom from the mind of a child. 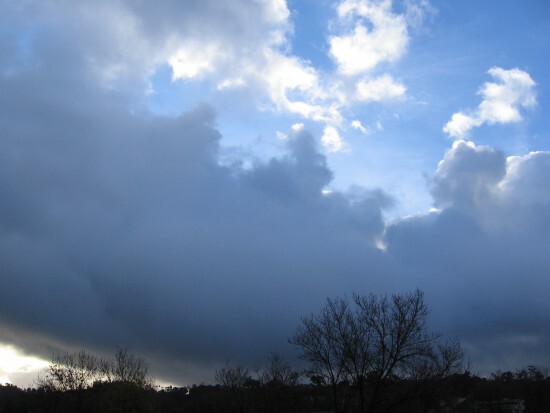 If you’ve ever had a bad day, and thought it will never stop raining, there’s a new short story you might enjoy reading. 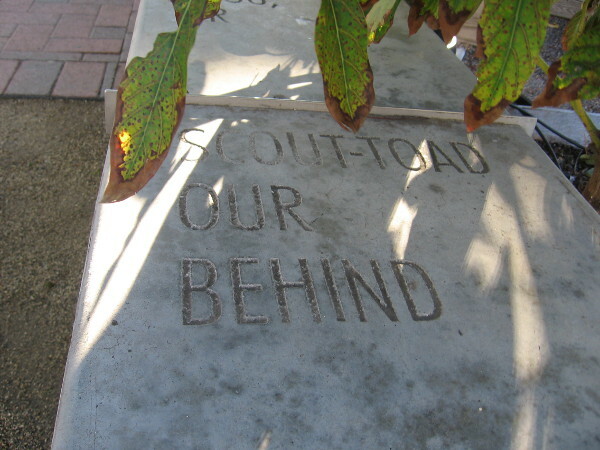 It concerns sadness. 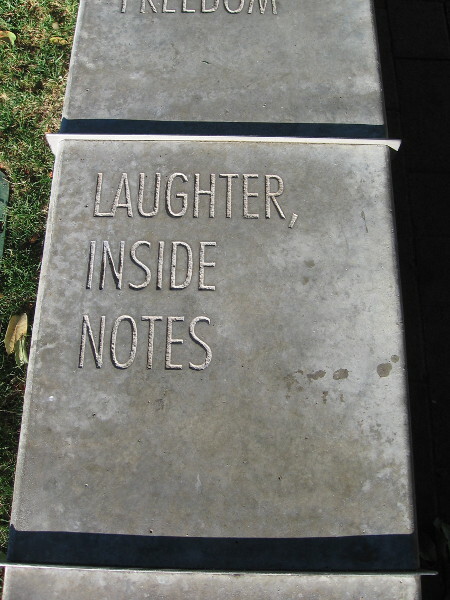 It contains a tiny bit of wisdom. 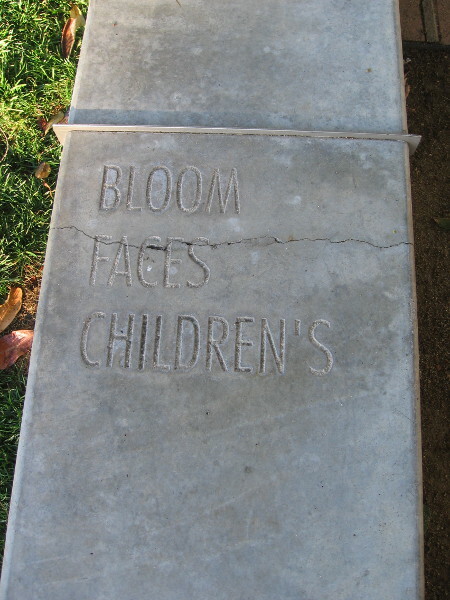 It’s titled A Child’s Lesson. 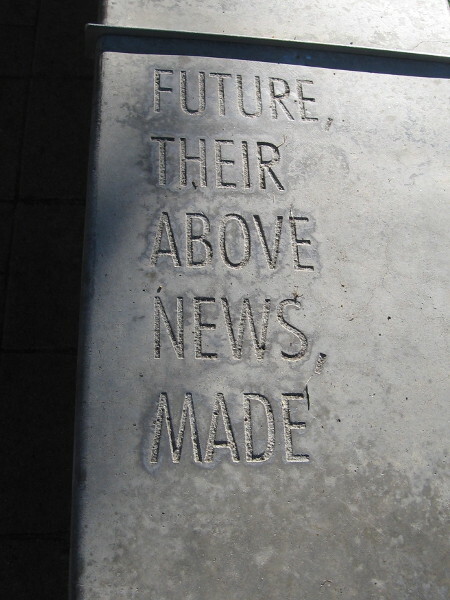 The words of this story are few and simple. 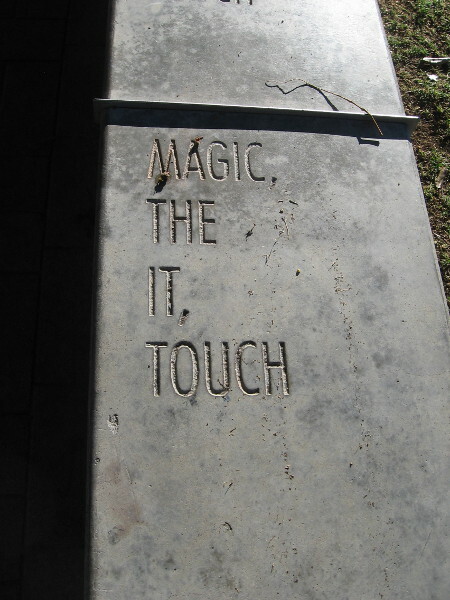 The end is a surprise. 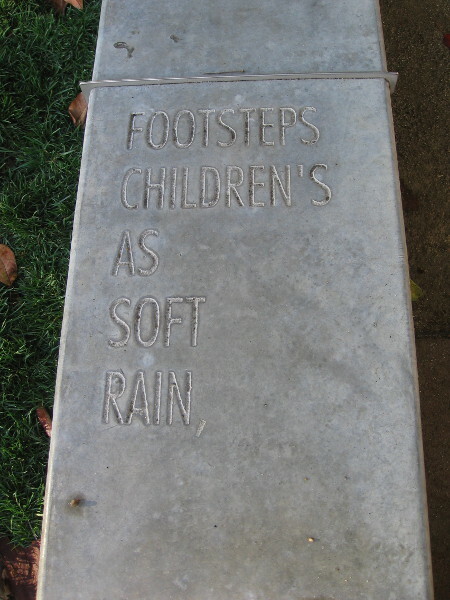 Posted on February 15, 2019 Tags children, fiction, life, rain, reading, short stories, truth, wisdom, words, writingLeave a comment on Surprising wisdom from the mind of a child. 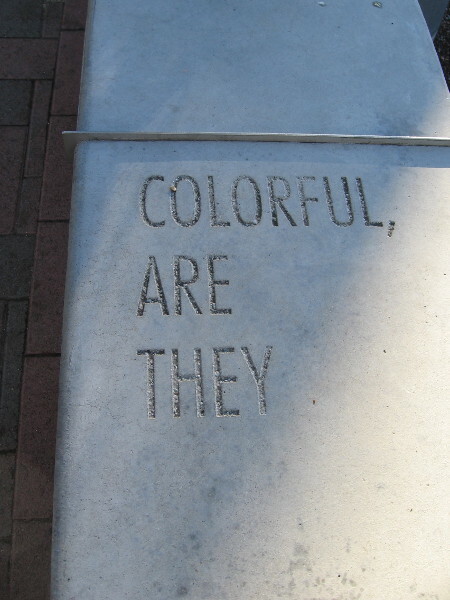 Fun art outside The New Children’s Museum! 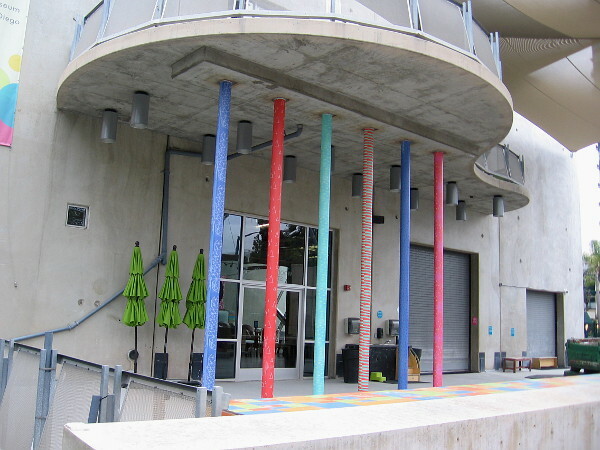 During my walk around downtown yesterday morning, I wandered past The New Children’s Museum. 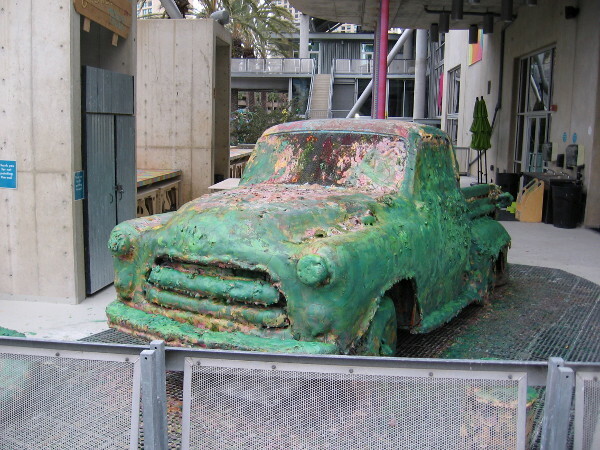 My camera immediately took aim at the 1950s Dodge pickup Flower Truck out on the Paint Patio. 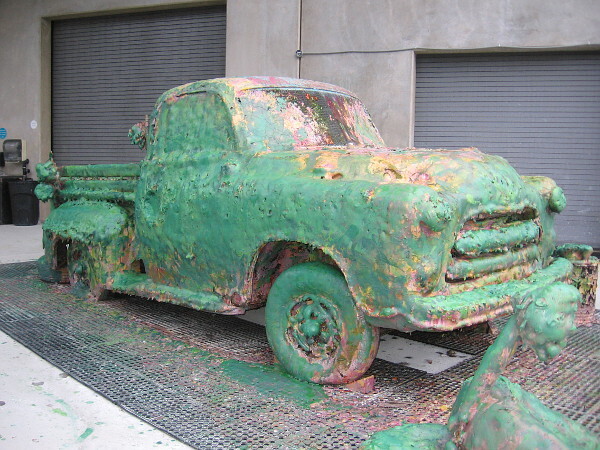 Kids have applied so many coats of paint to the museum’s current Painted Object that the vintage truck appears to be covered with dripped candle wax! 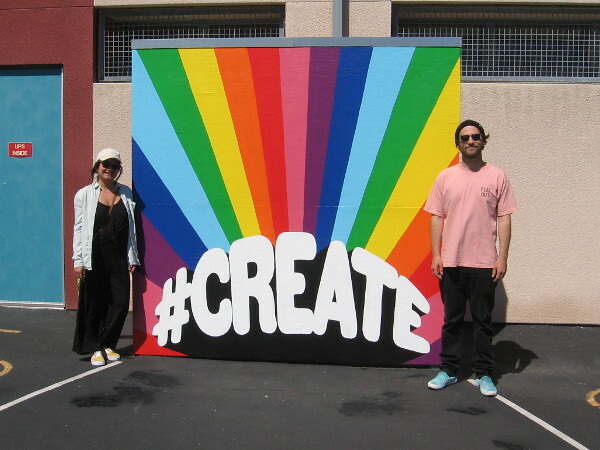 I also enjoyed looking at the long, rainbow-like SMILE mural on the museum’s entrance bridge, painted by street artist Paola Villaseñor, who signs her work PANCA. 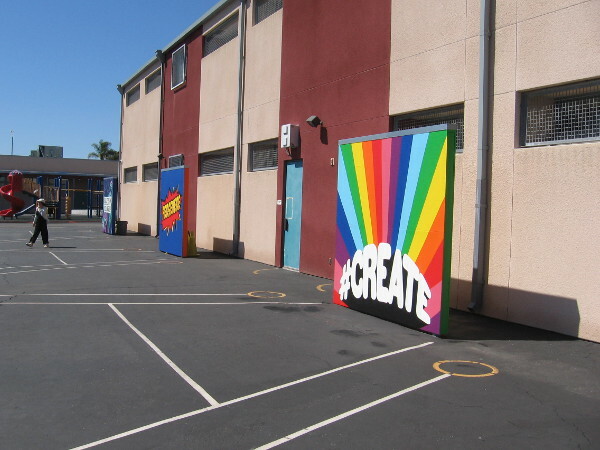 Her urban artwork, which is usually more “adult” and grotesque, can be found in both Tijuana and San Diego. 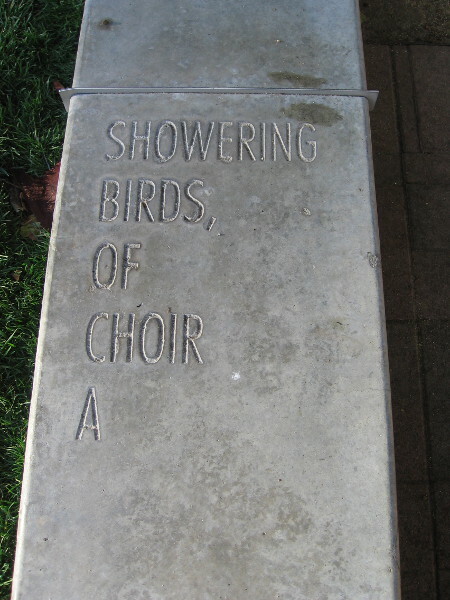 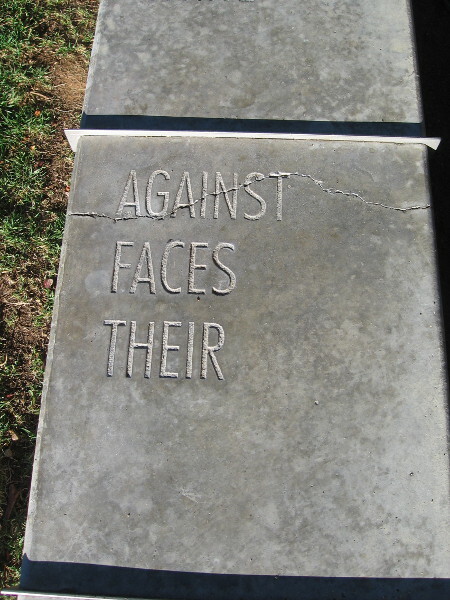 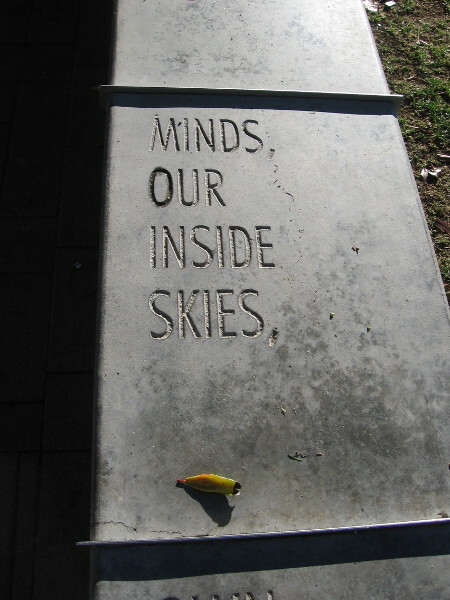 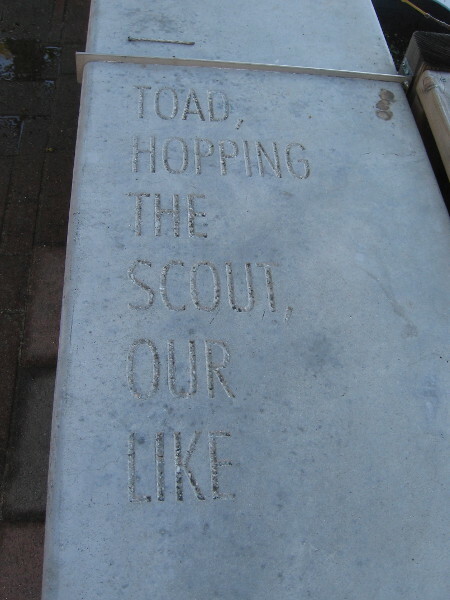 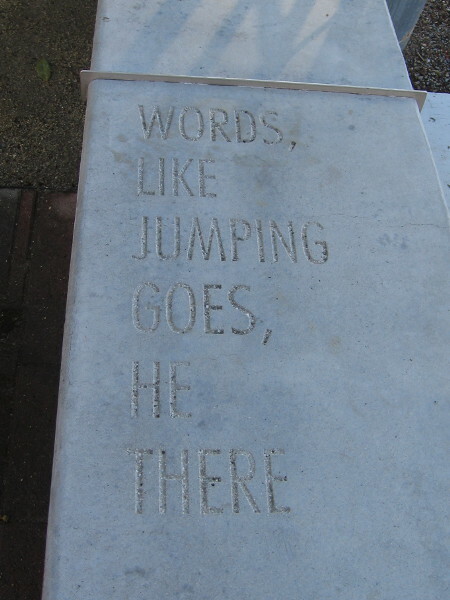 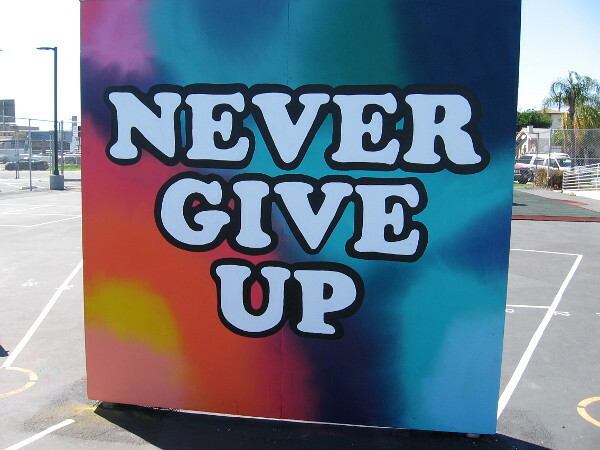 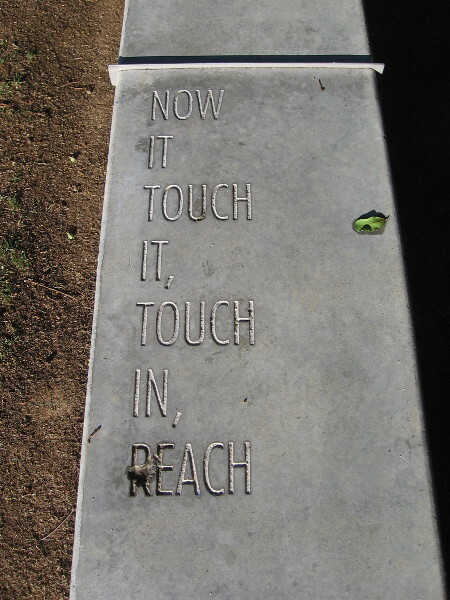 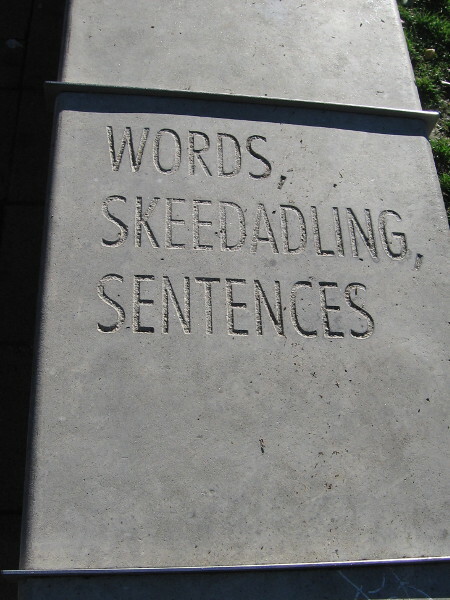 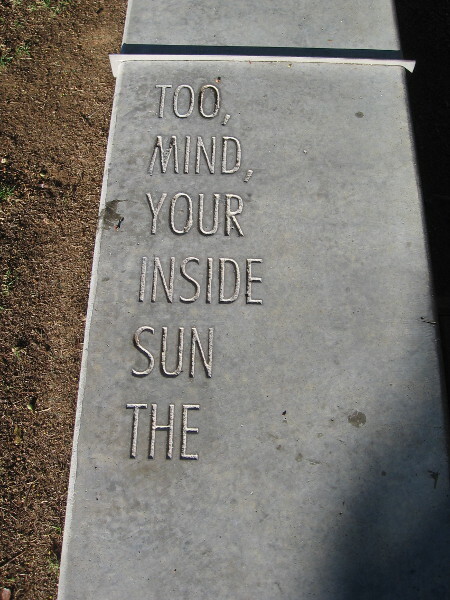 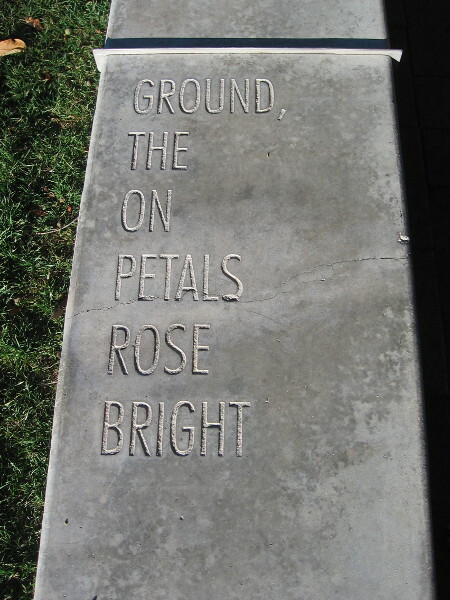 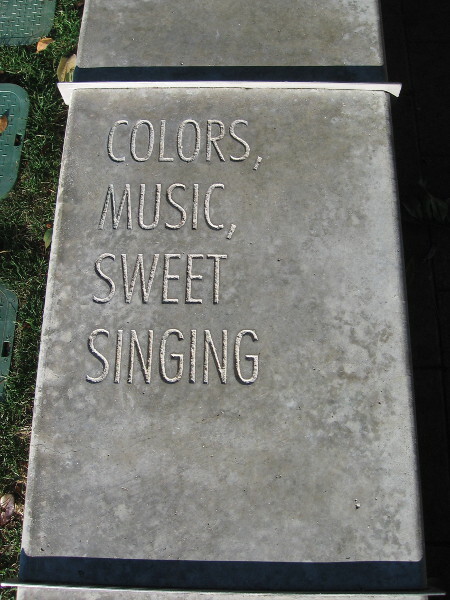 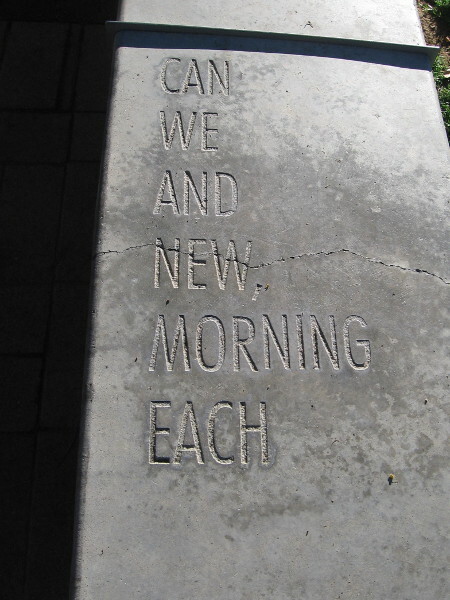 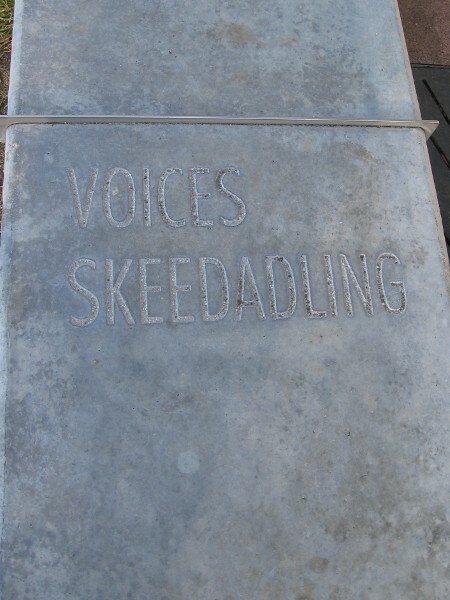 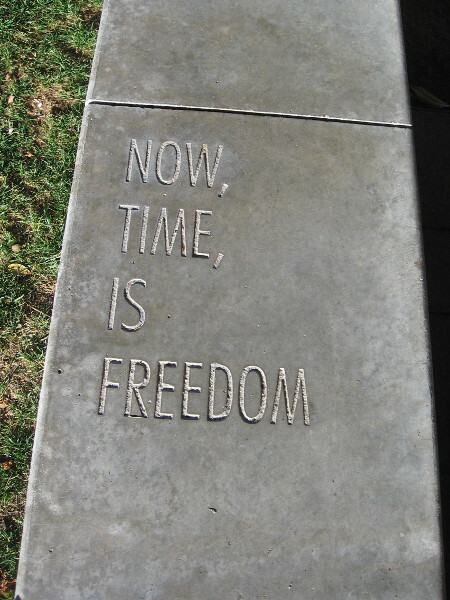 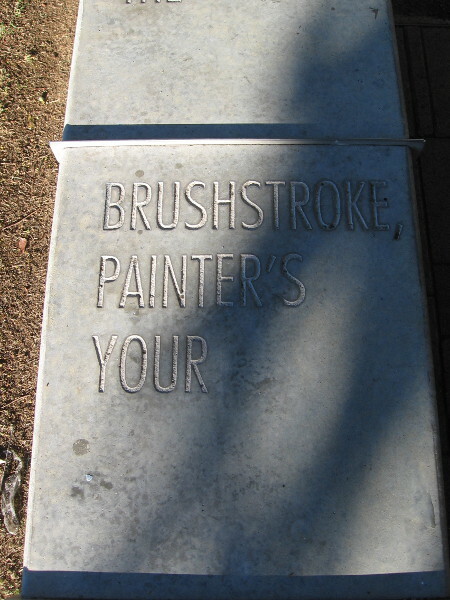 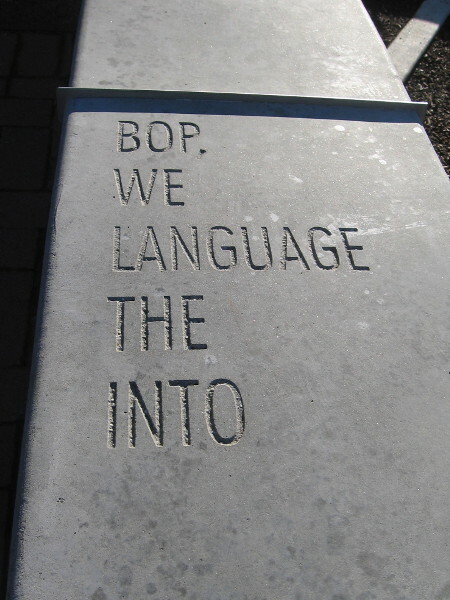 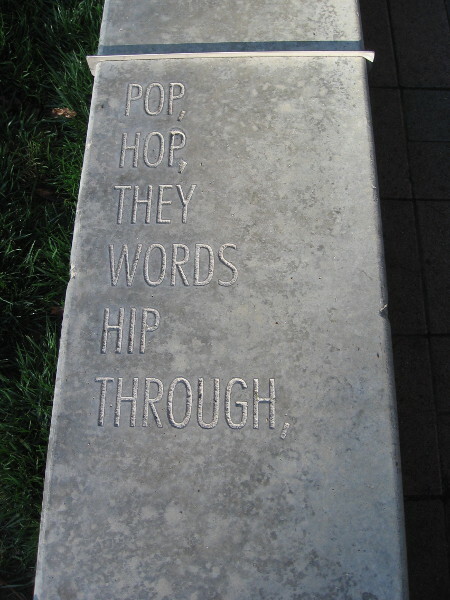 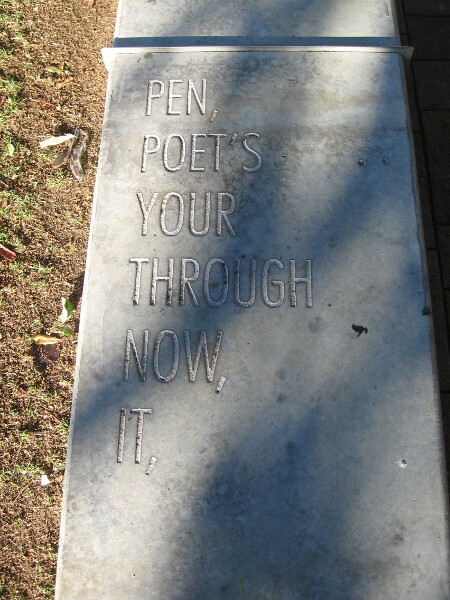 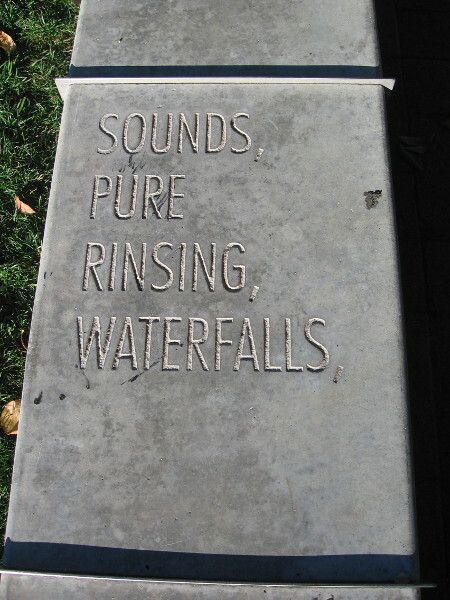 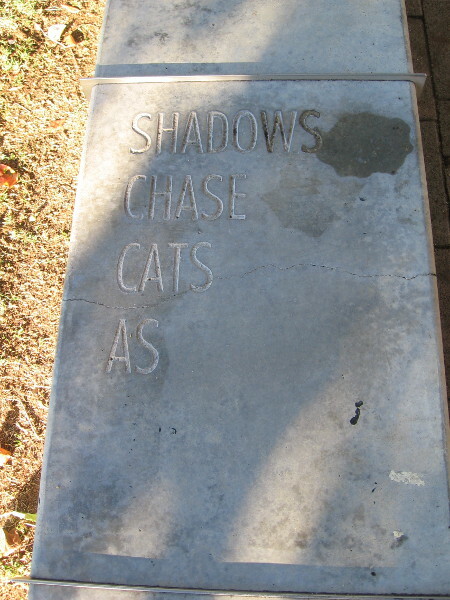 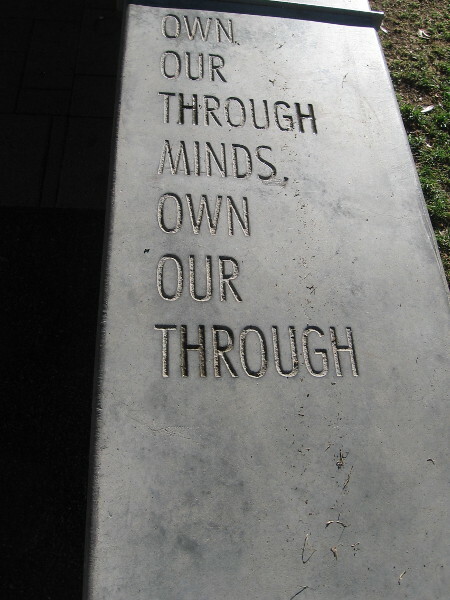 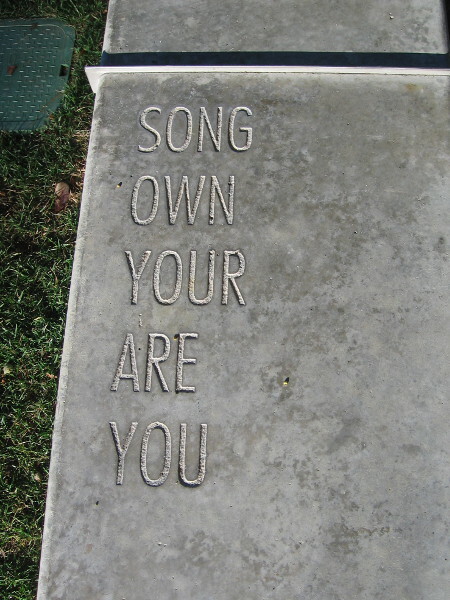 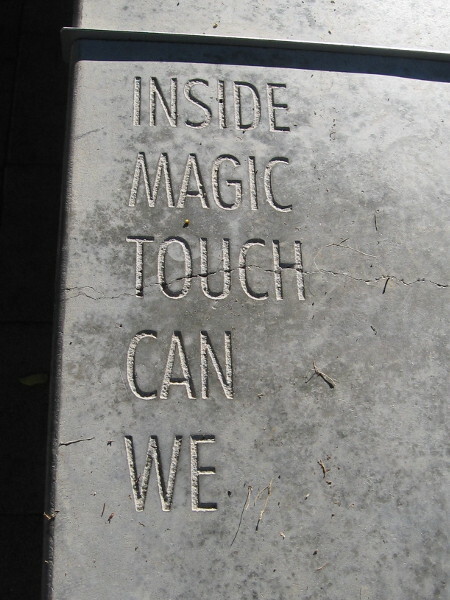 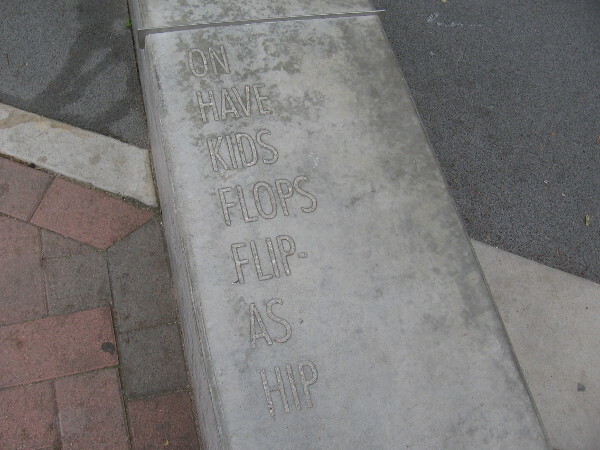 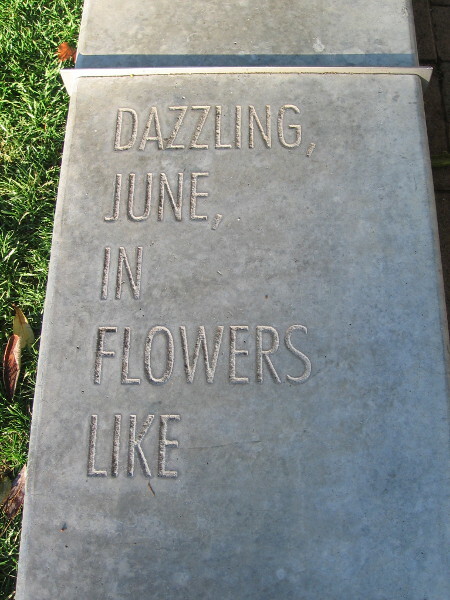 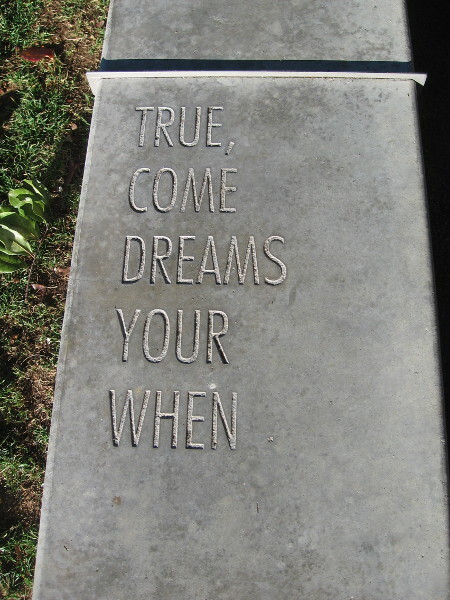 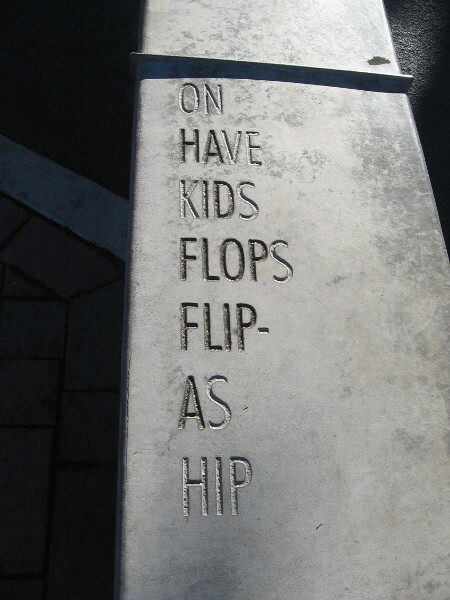 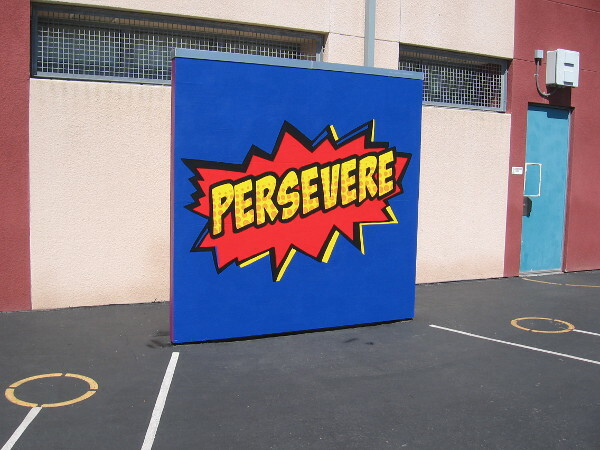 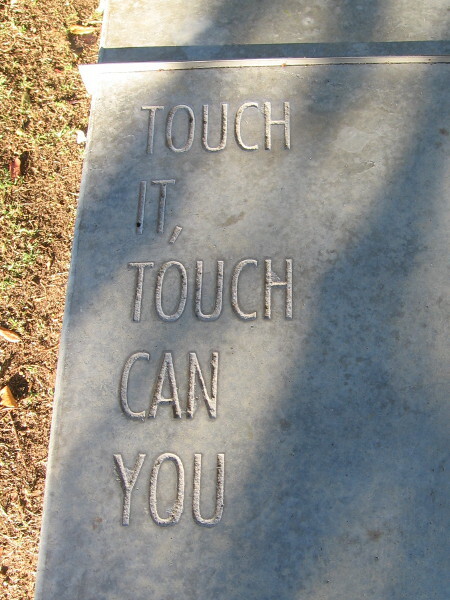 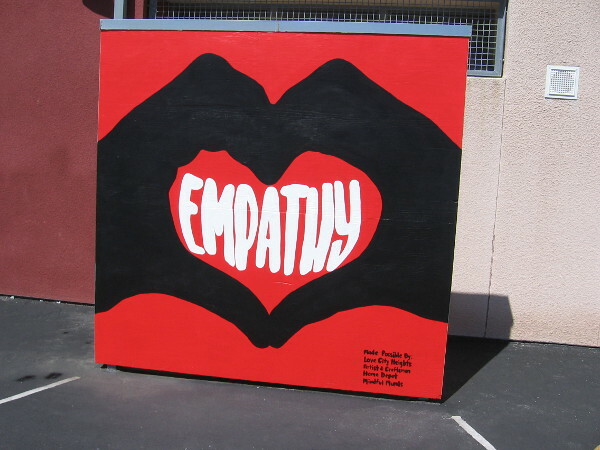 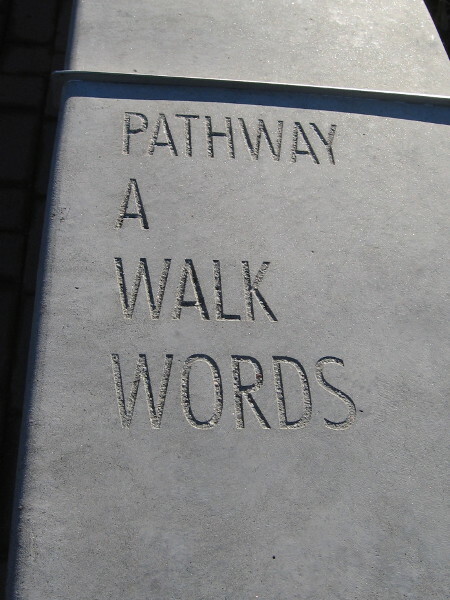 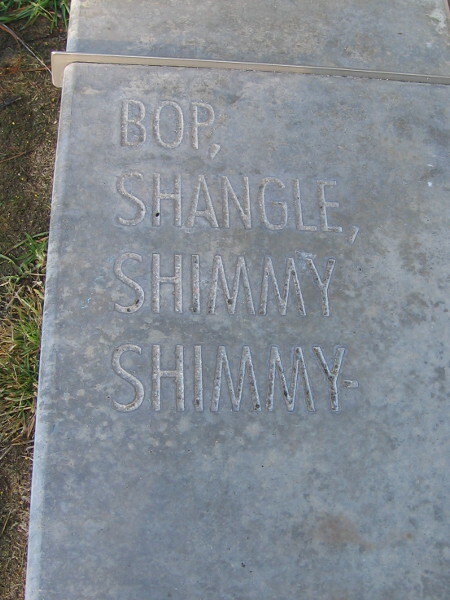 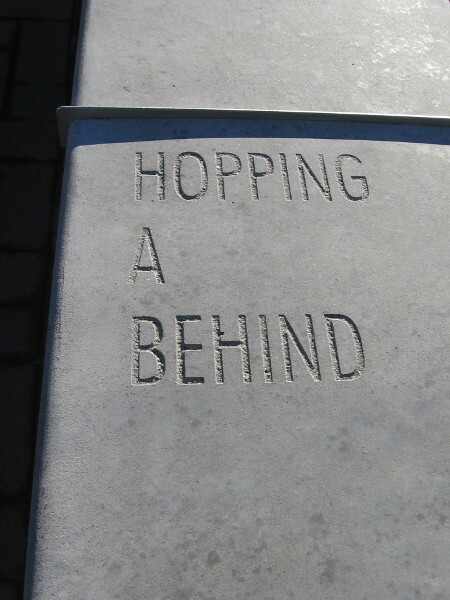 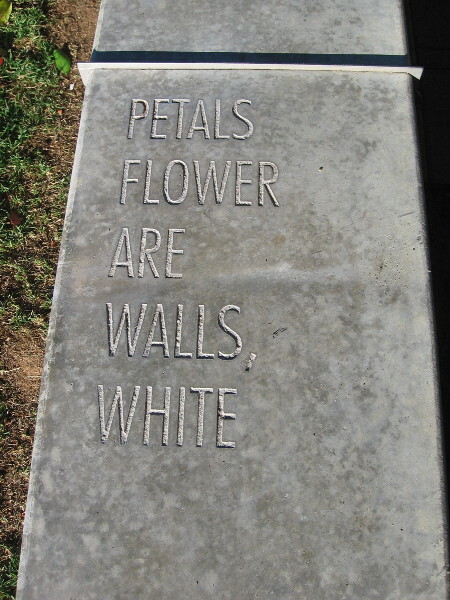 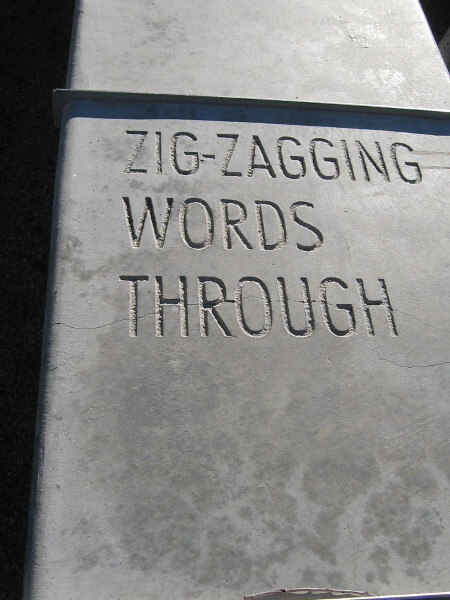 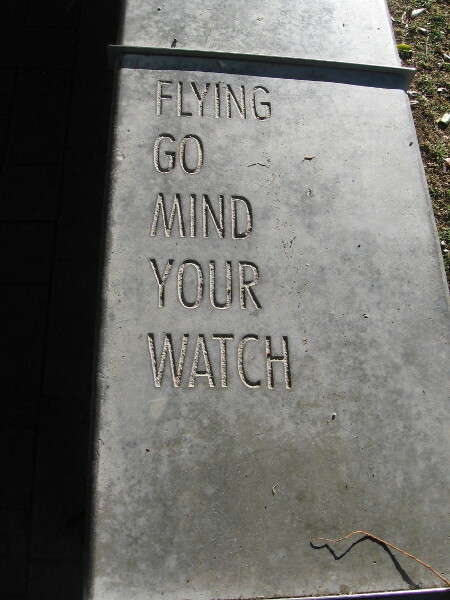 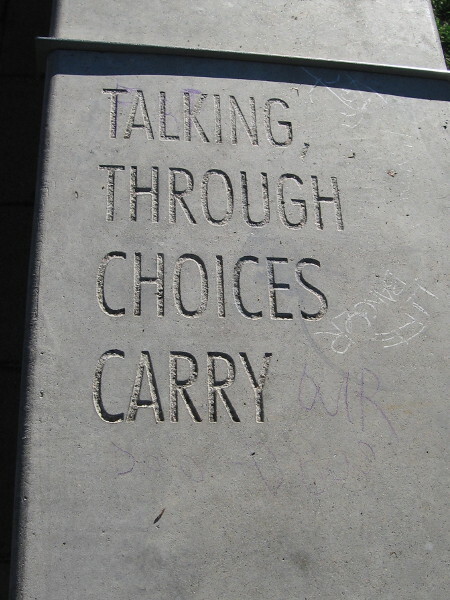 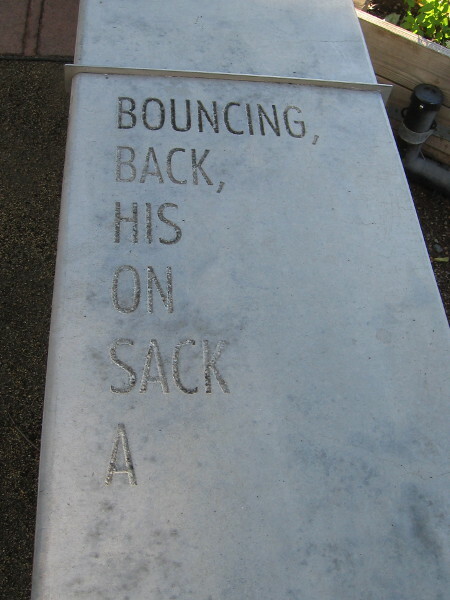 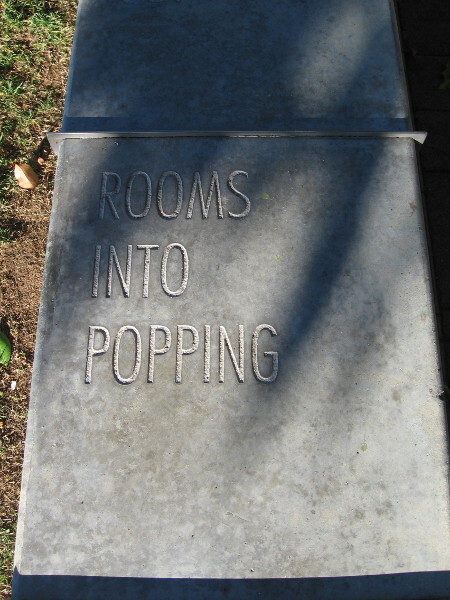 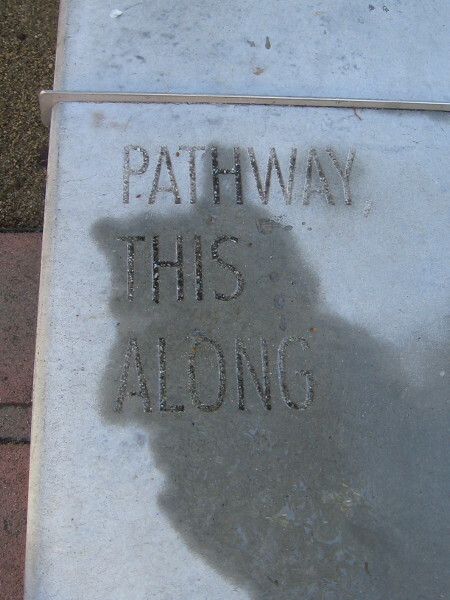 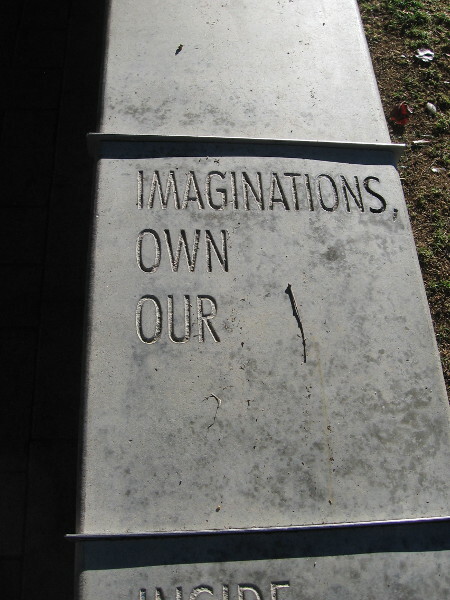 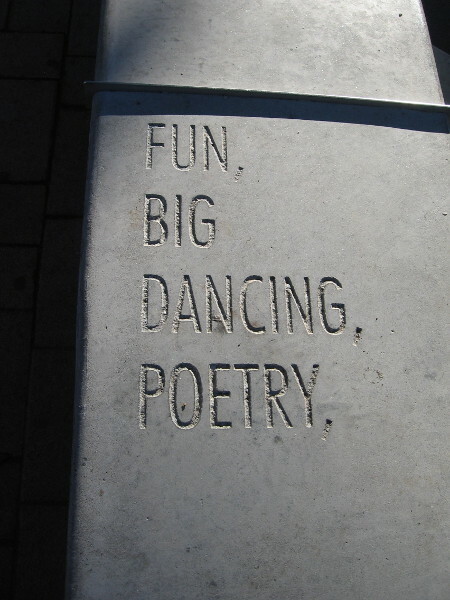 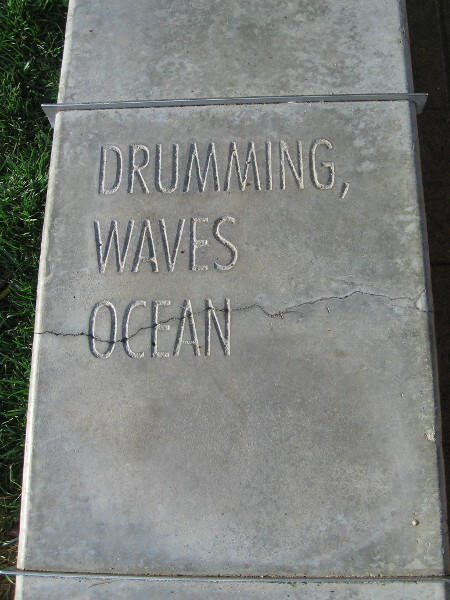 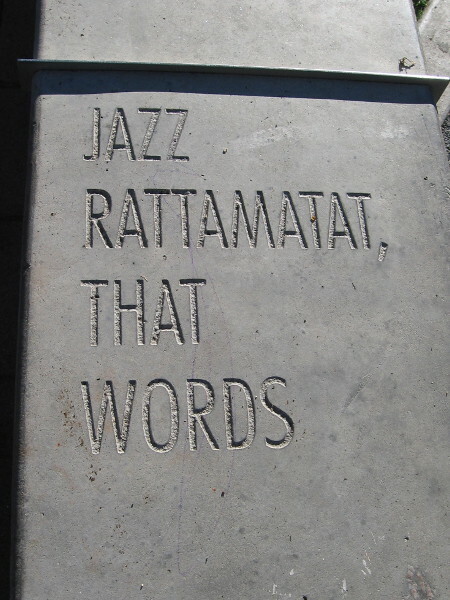 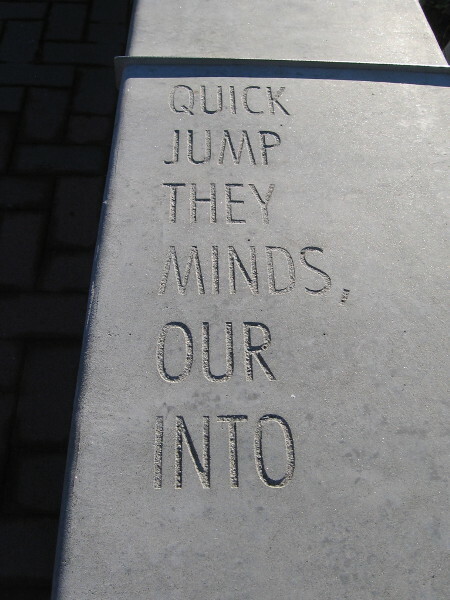 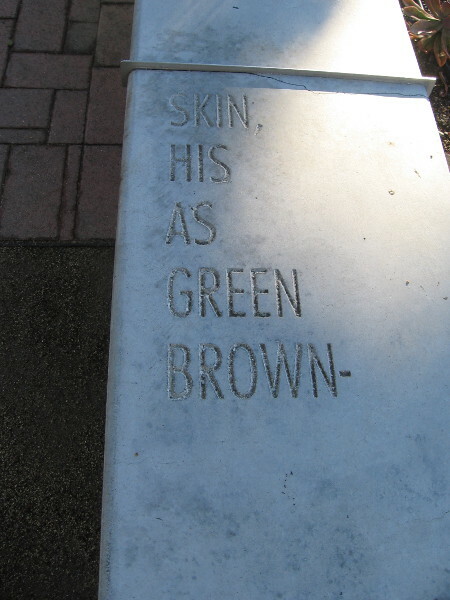 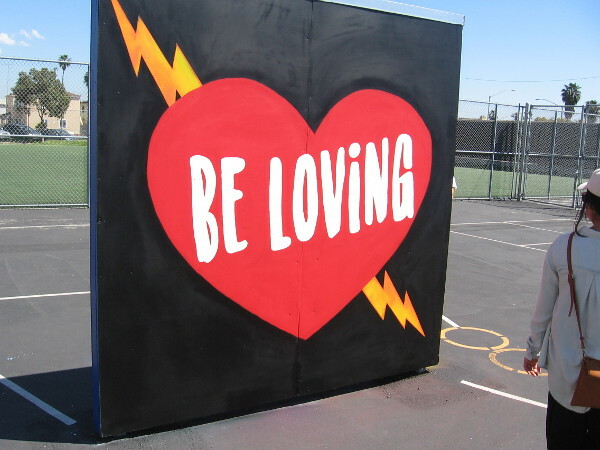 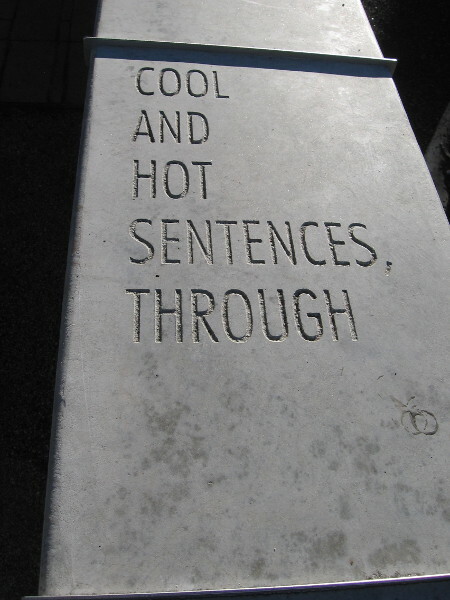 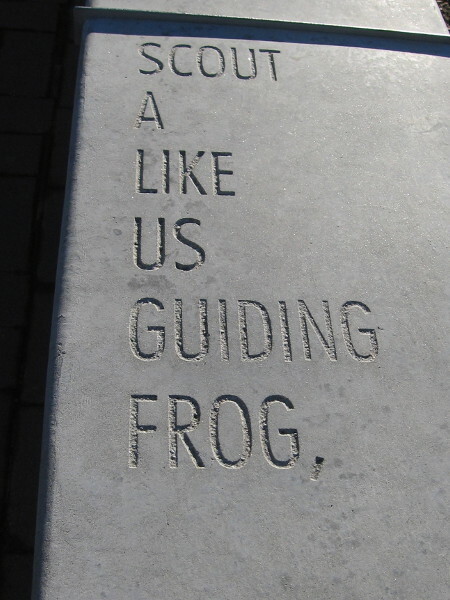 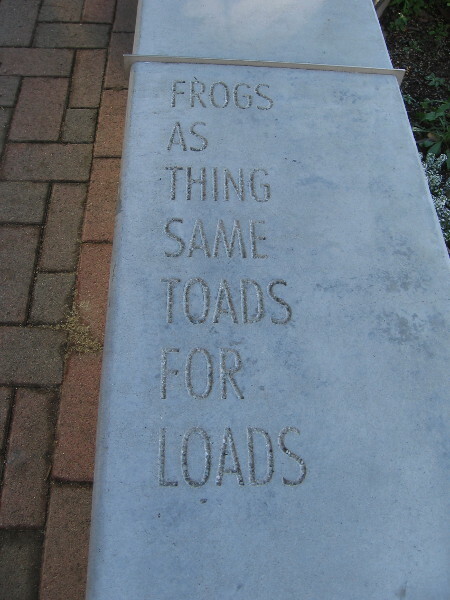 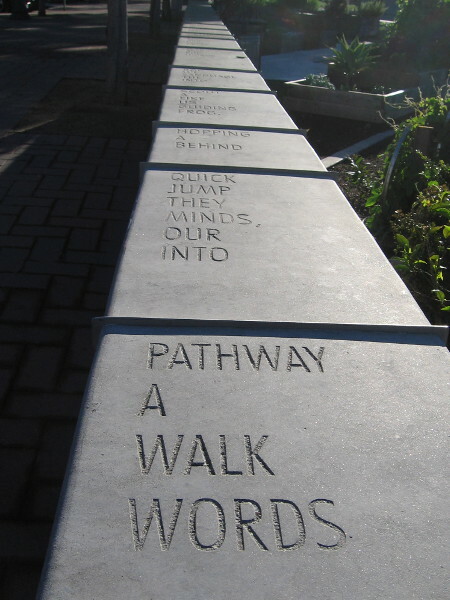 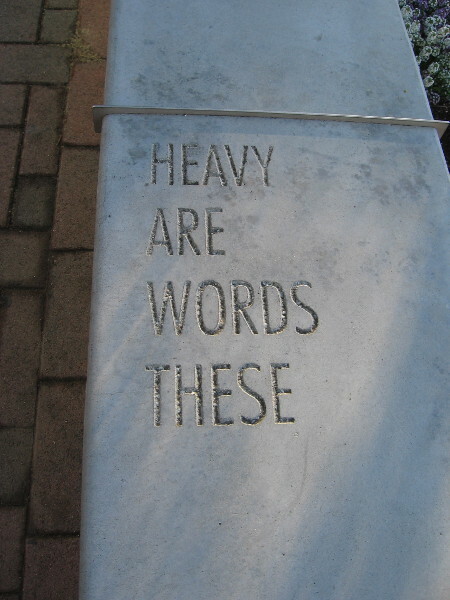 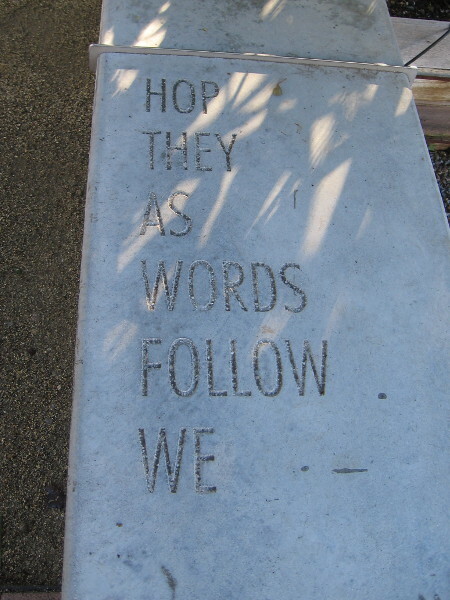 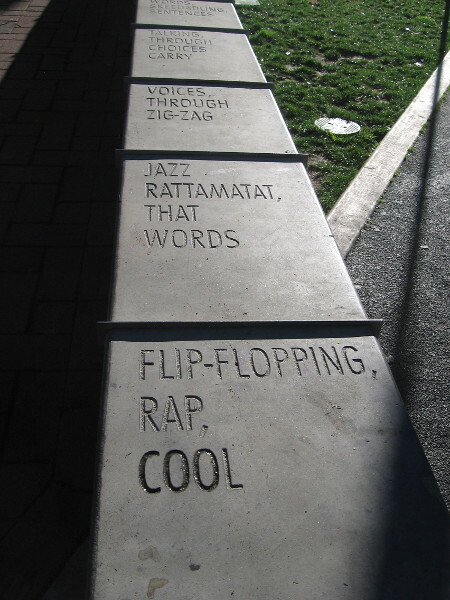 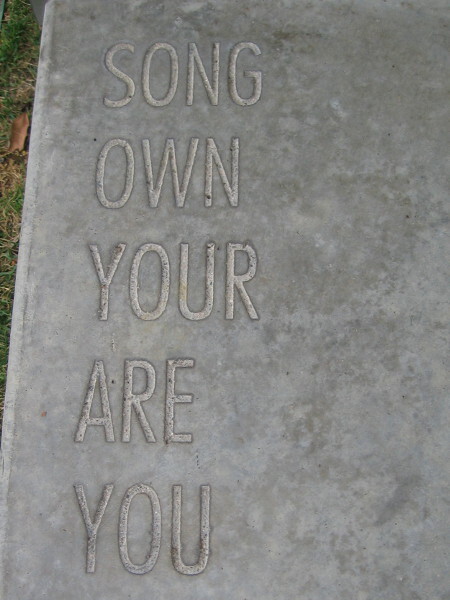 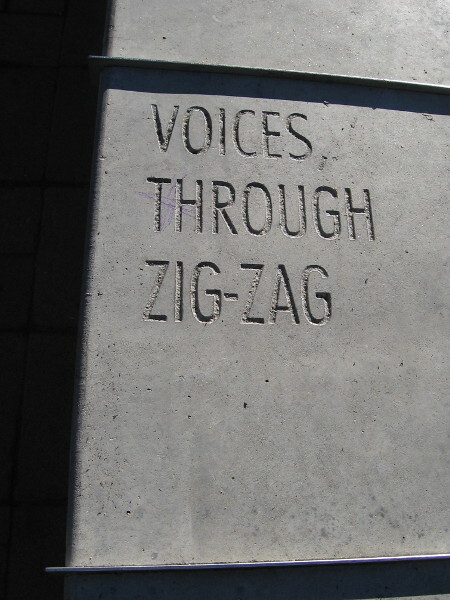 Those words on a low wall bordering the museum’s playground and The Garden Project are part of FOLLOWING THE WORDS, poetry by Quincy Troupe, professor emeritus at the University of California, San Diego. 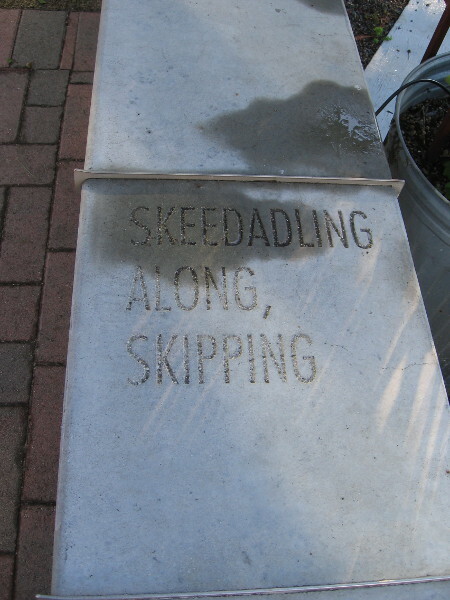 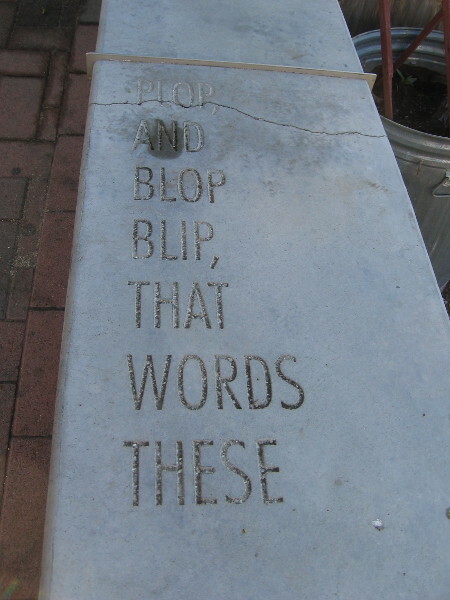 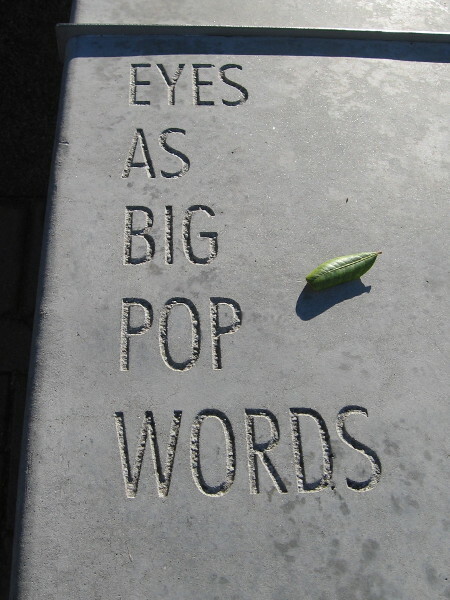 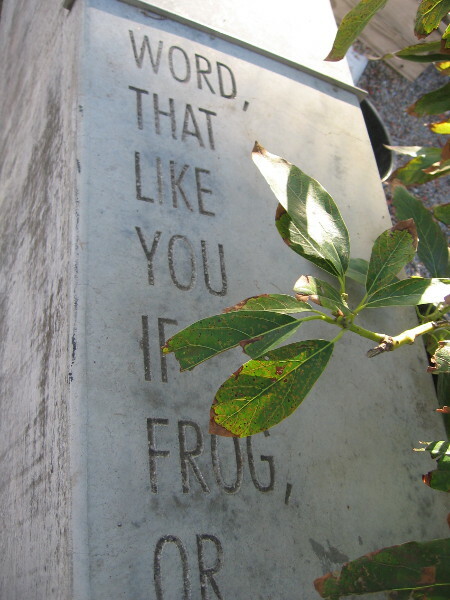 In late 2014 I posted photos of the small garden and other lines of the linguistically lip-lively poem here. 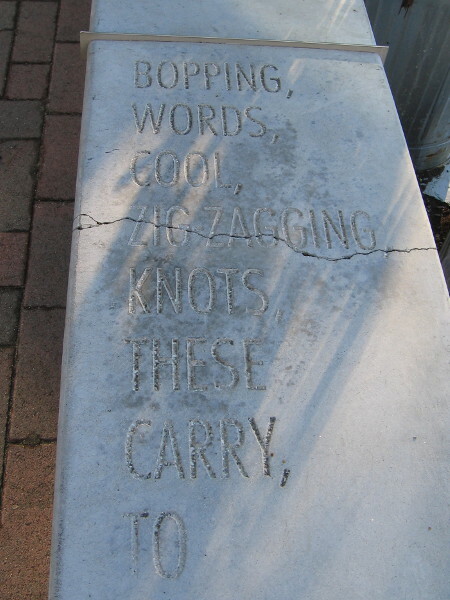 Perhaps one day I’ll photograph the entire long poem! 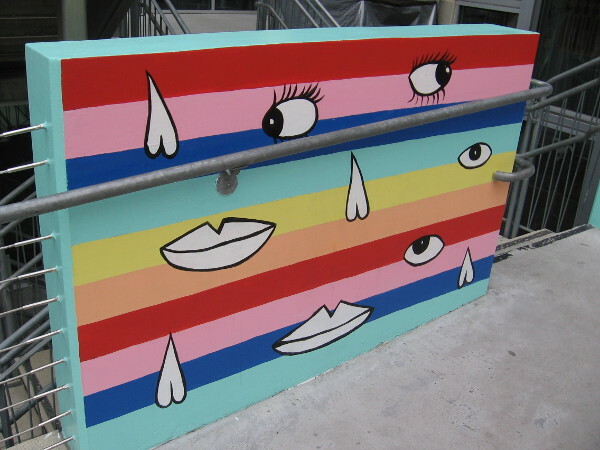 Section of SMILE, by artist PANCA. 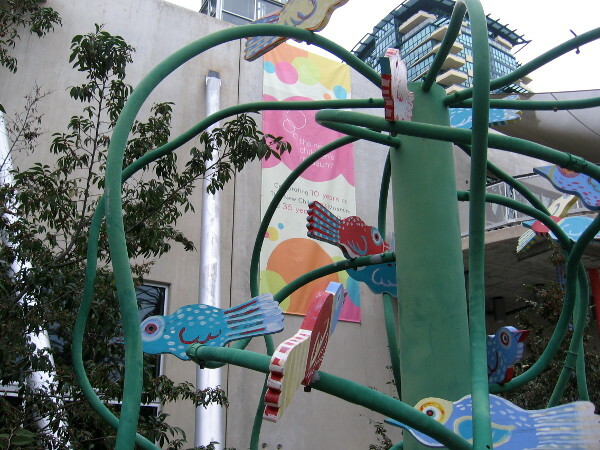 The fun 48-foot-long mural decorates the bridge leading to the entrance of The New Children’s Museum. 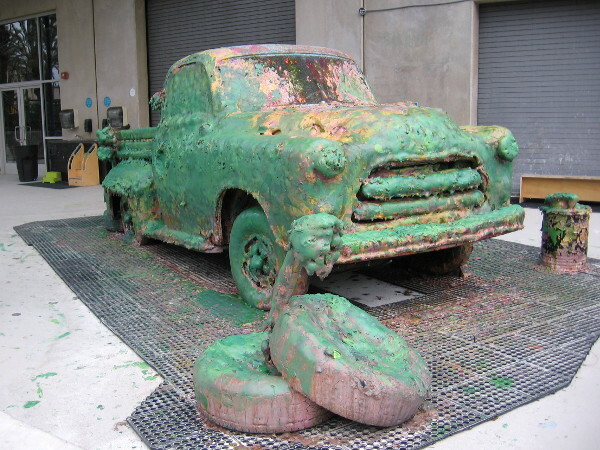 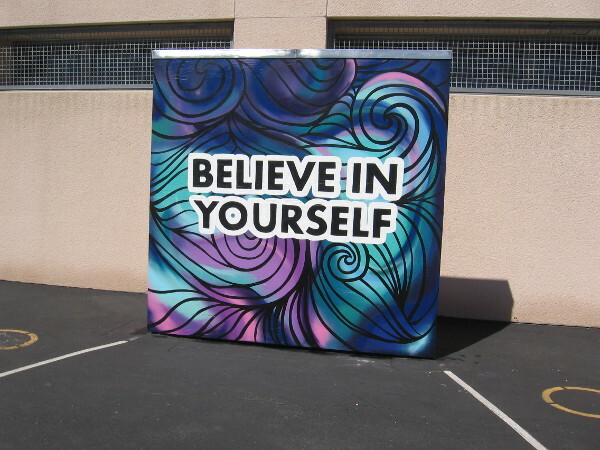 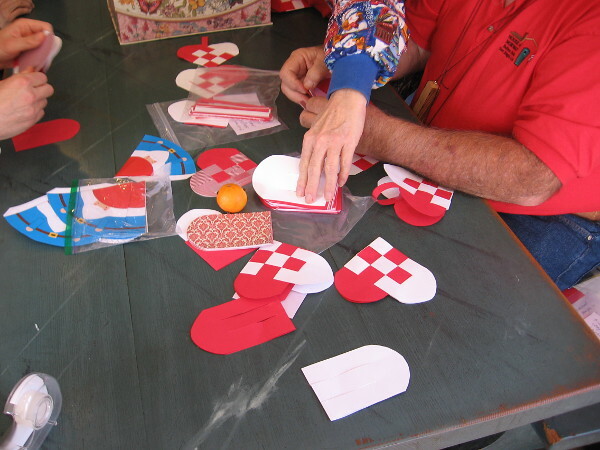 Posted on February 14, 2019 February 14, 2019 Tags art, artists, children, creativity, downtown, fun, imagination, kids, museums, painting, photography, poetry, san diego, trucksLeave a comment on Fun art outside The New Children’s Museum! 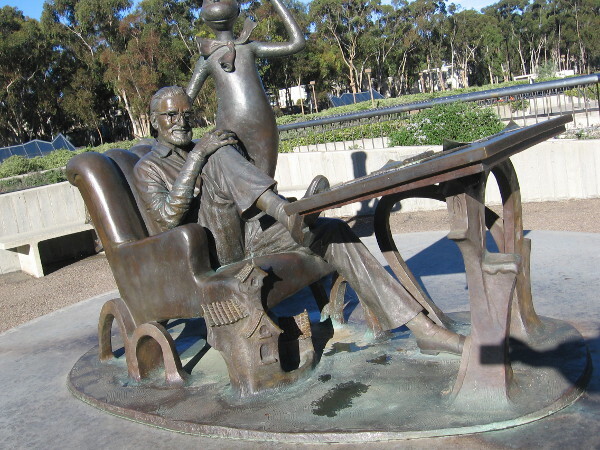 Dr. Seuss and Cat in the Hat sculpture at UCSD. 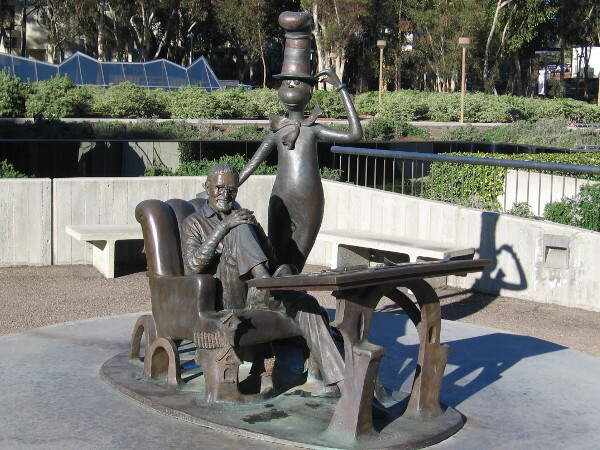 Dr. Seuss and The Cat in the Hat are cast in bronze at UC San Diego in La Jolla, not far from the place where the famous children’s author resided much of his life. 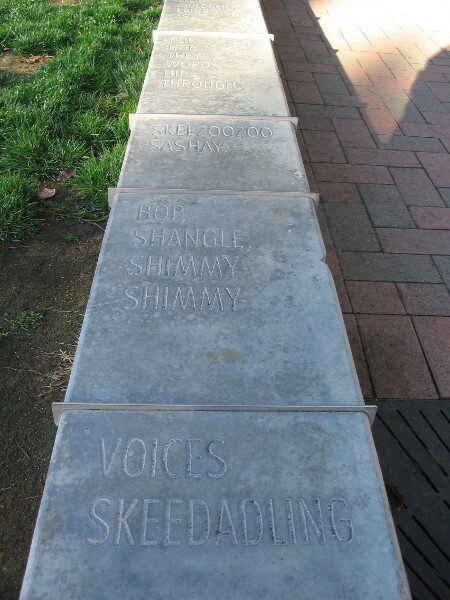 In 2004, the 100th anniversary of the birth of Dr. Seuss, the Theodor Seuss Geisel Memorial made its debut outside the Geisel Library at UC San Diego. 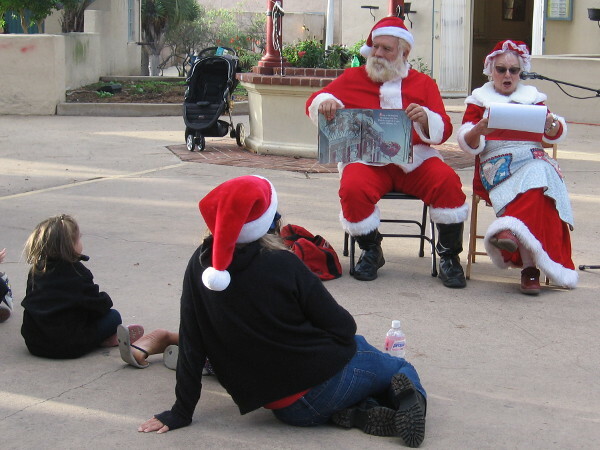 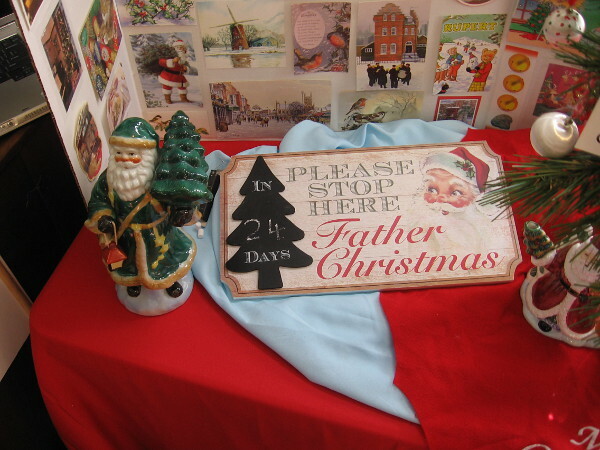 The famous children’s book author and illustrator spent the second half of his life living in La Jolla, in a home not far from the university. 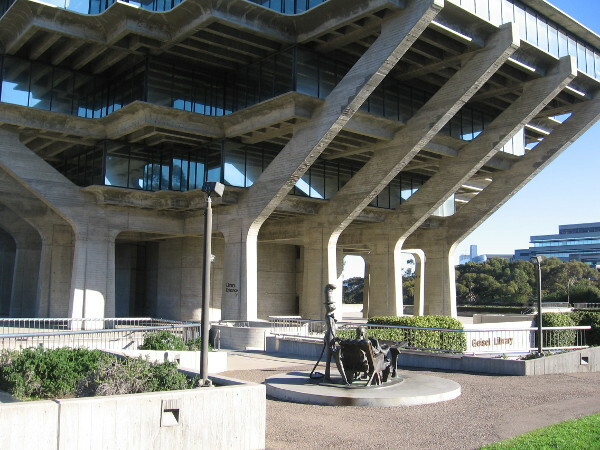 The University of California San Diego’s main library, the Geisel Library, is now home of the Dr. Seuss Collection. 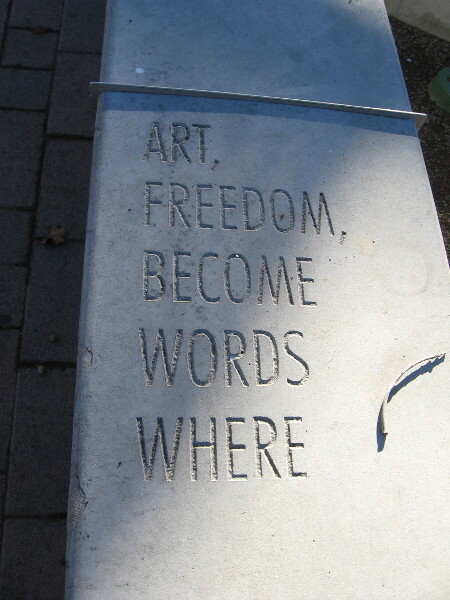 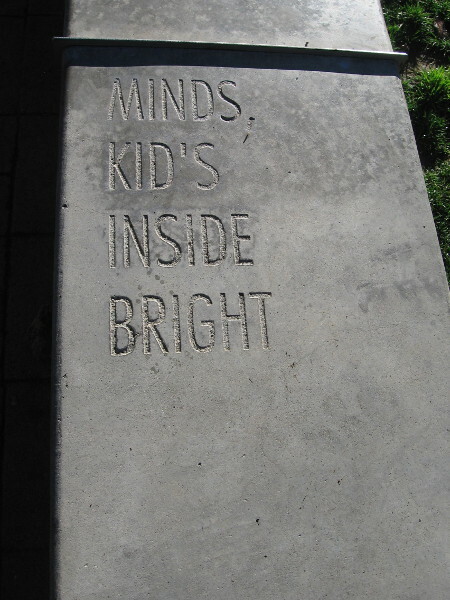 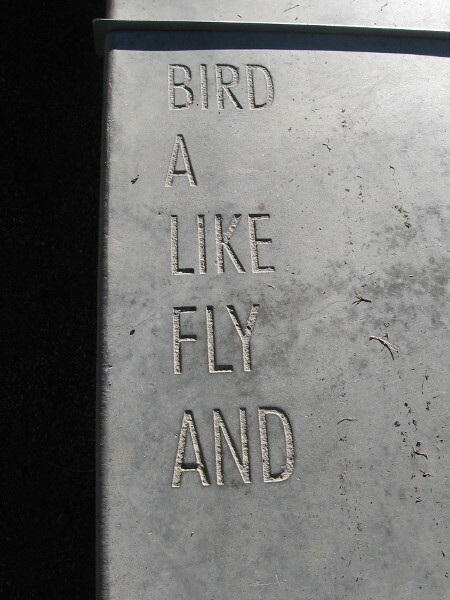 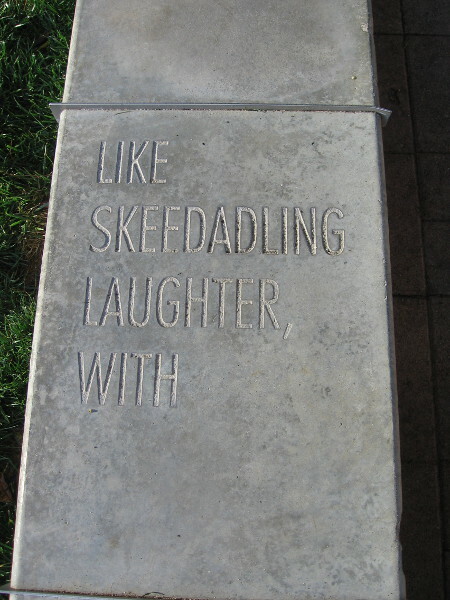 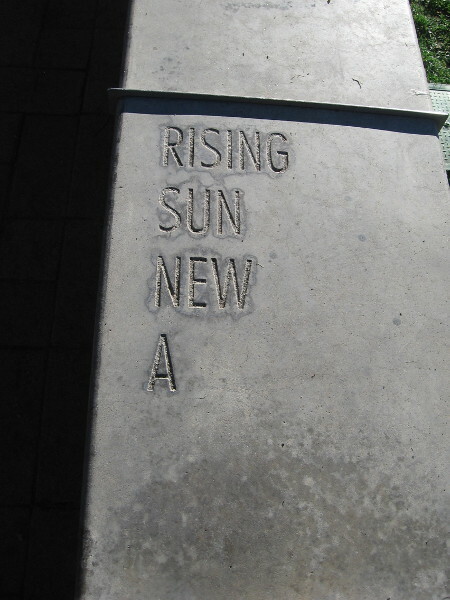 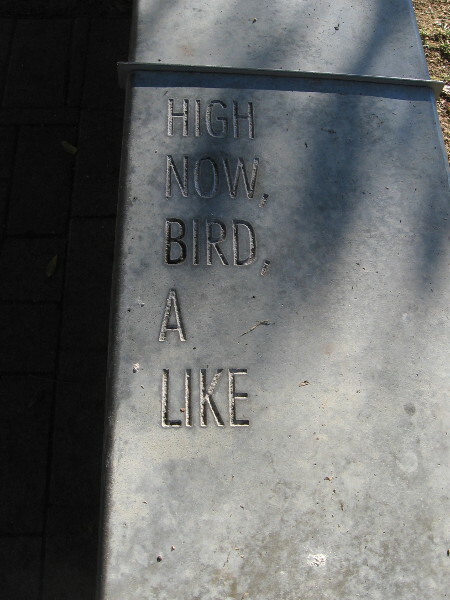 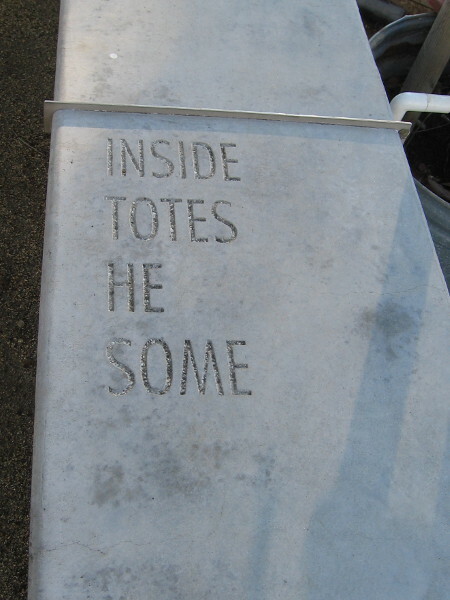 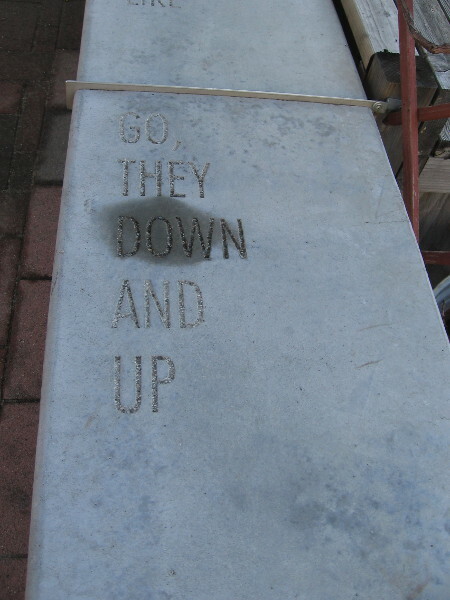 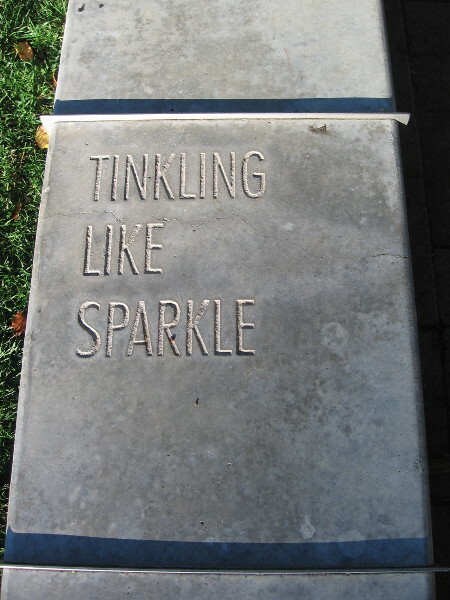 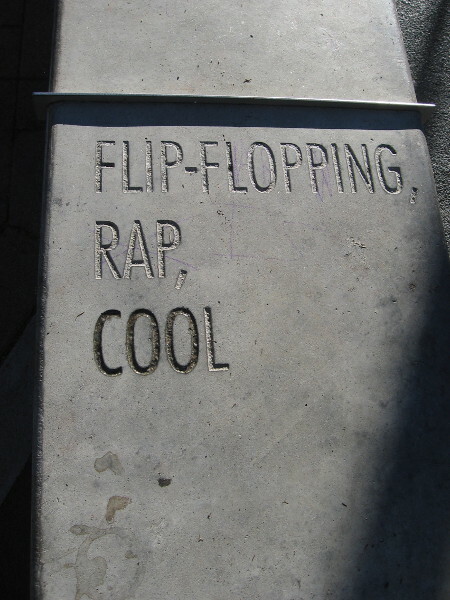 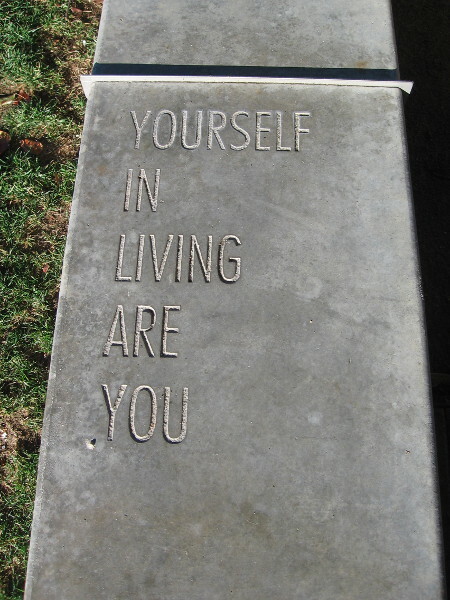 The inspiring sculpture on the plaza outside the library is by Lark Grey Dimond-Cates. 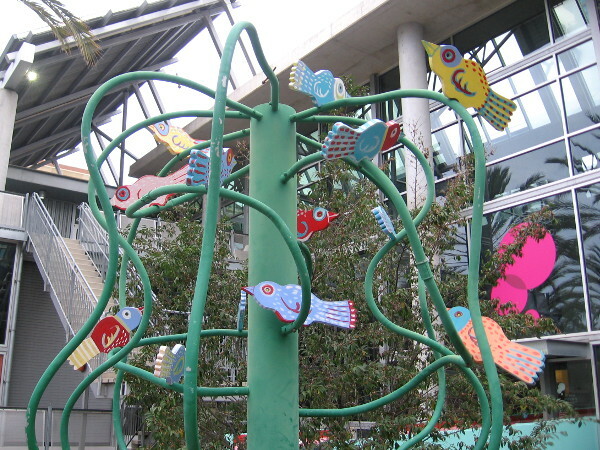 The Cat in the Hat stands at Dr. Seuss’ shoulder holding an umbrella. 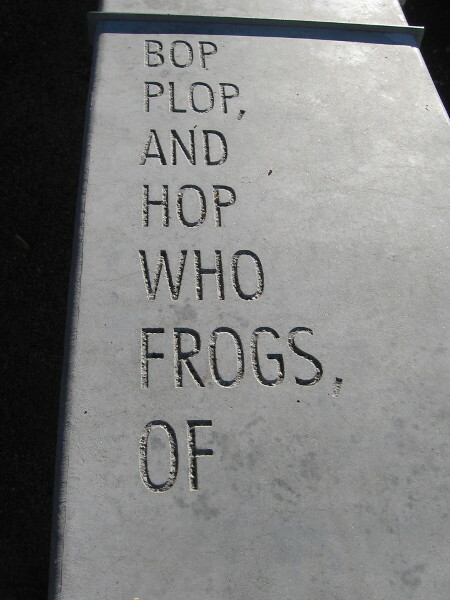 The original casting of this whimsical sculpture and many others like it can also be found at the Dr. Seuss National Memorial Sculpture Garden at the Springfield Museums’ Quadrangle in Springfield, Massachusetts, the birthplace of Theodor Seuss Geisel. 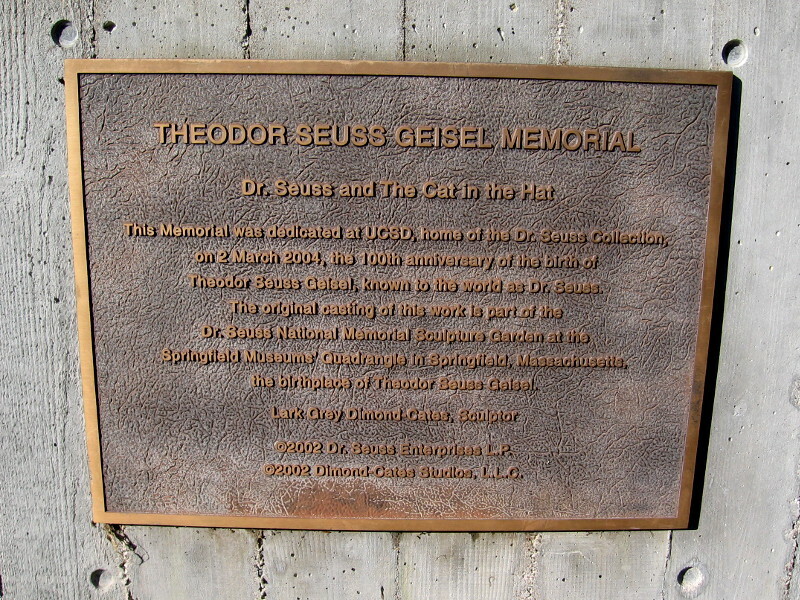 Plaque describes the Theodor Seuss Geisel Memorial at UC San Diego, home of the Dr. Seuss Collection. 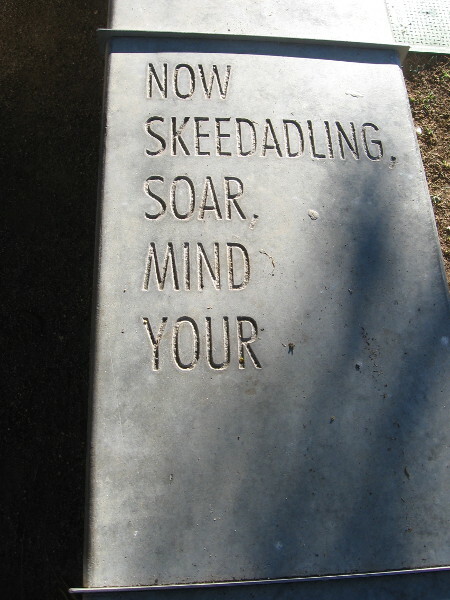 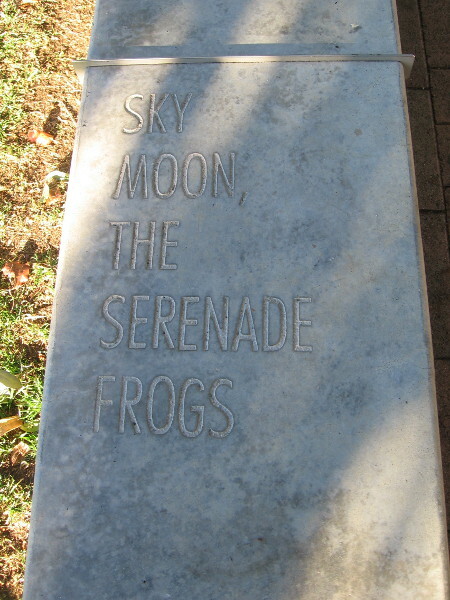 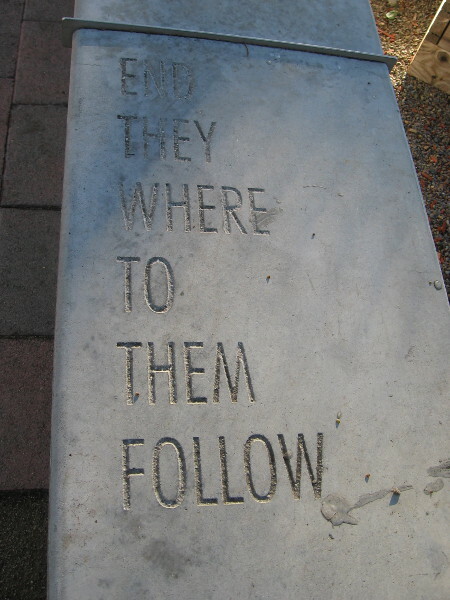 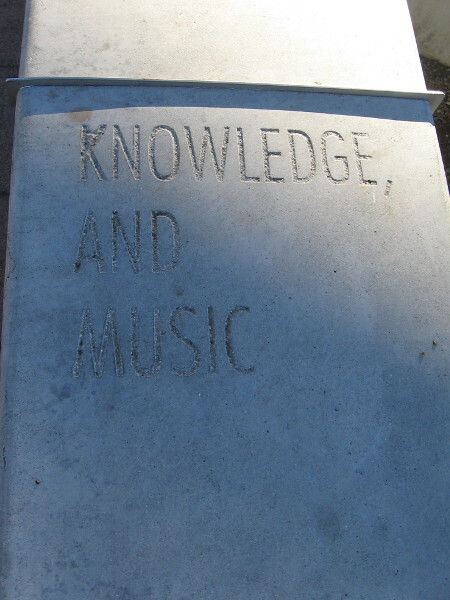 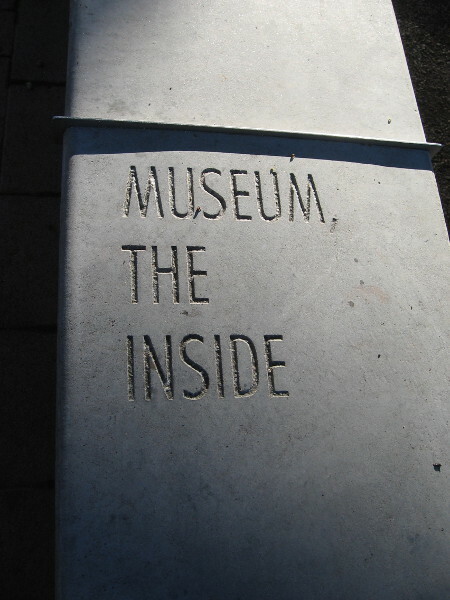 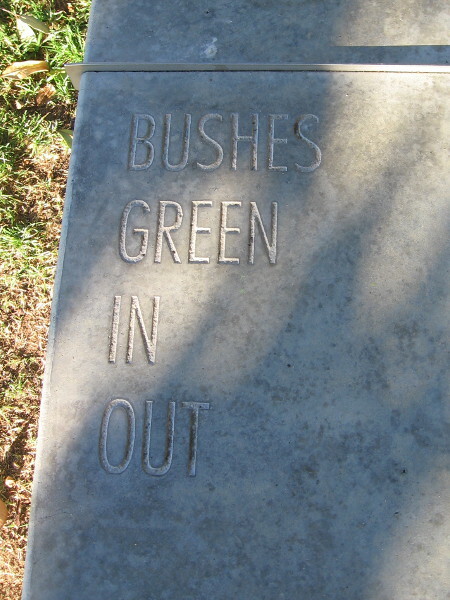 The memorial, by sculptor Lark Grey Dimond-Cates, was dedicated on 2 March 2004. 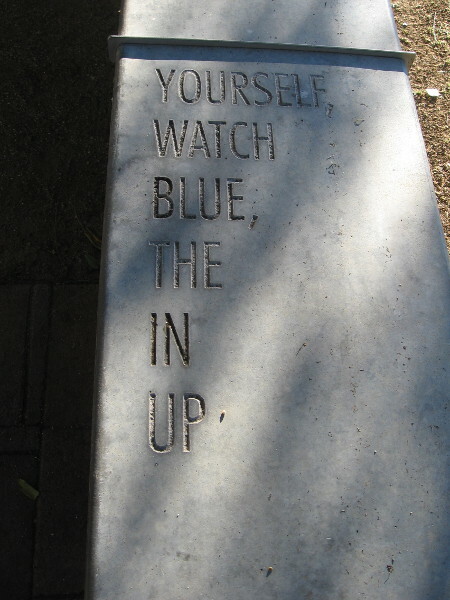 The Theodor Seuss Geisel Memorial stands on the outdoor Forum Level of the Geisel Library at UCSD. 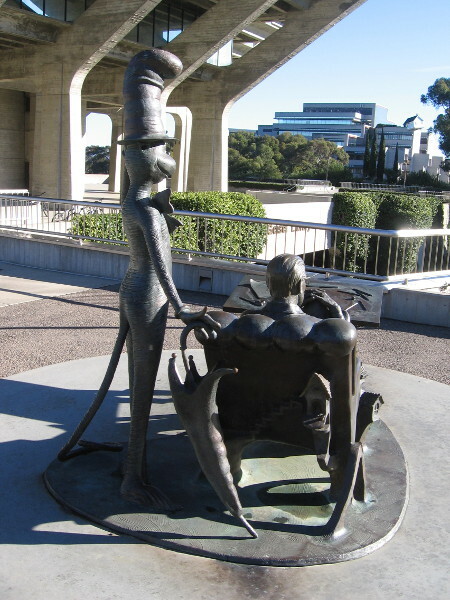 A tall bronze The Cat in the Hat stands with an umbrella at the shoulder of Dr. Seuss. 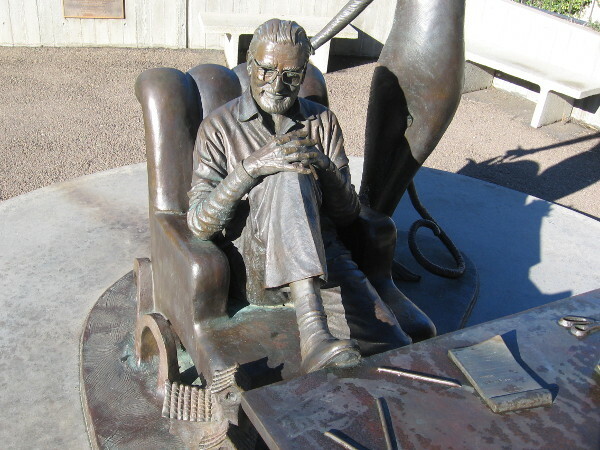 Dr. Seuss relaxes and reflects for a moment with a foot up on his work table. 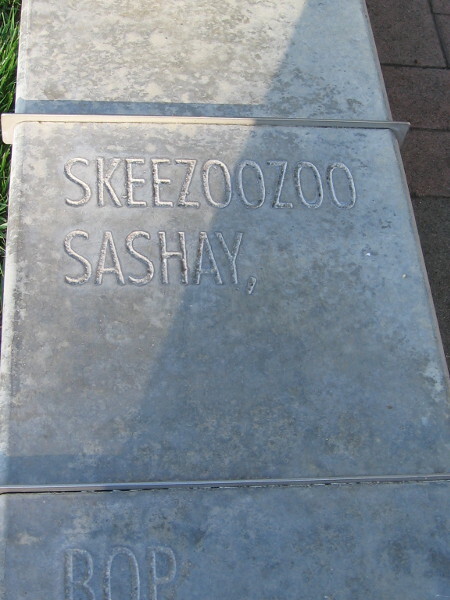 A thoughtful, pleasant moment as a famous children’s book author and illustrator takes a break to dream. 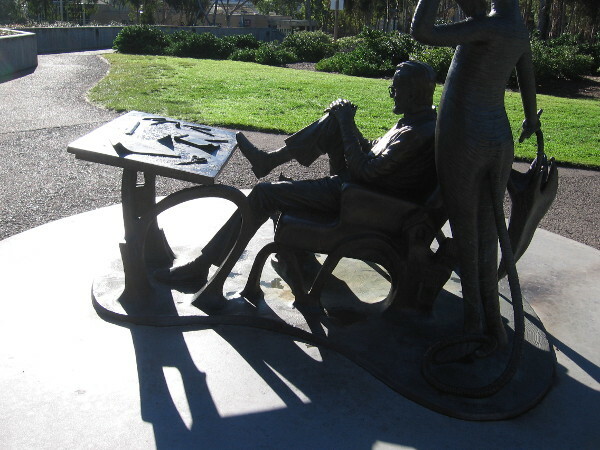 Looking over the bronze shoulder of Dr. Seuss on a sunny day in La Jolla. 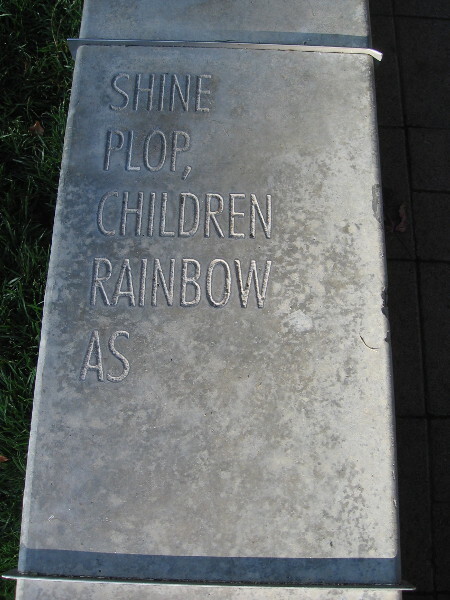 An immortal children’s character from The Cat in the Hat cast in bronze. 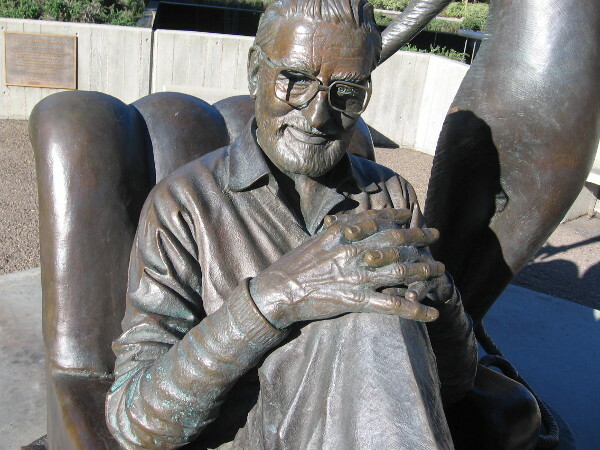 The friendly, wise face of beloved author Theodor Seuss Geisel. 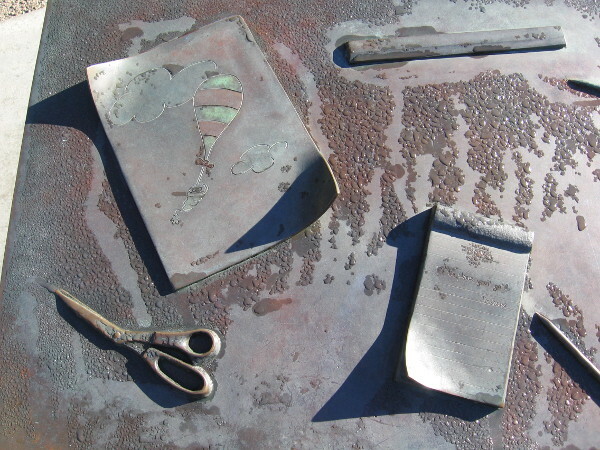 The work table of a world-famous children’s author and artist. 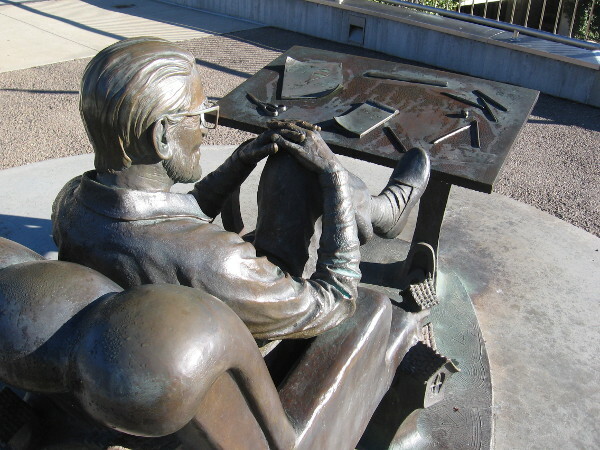 The inspiring bronze Theodor Seuss Geisel Memorial can be found outside the southwest corner of the Geisel Library at UC San Diego. 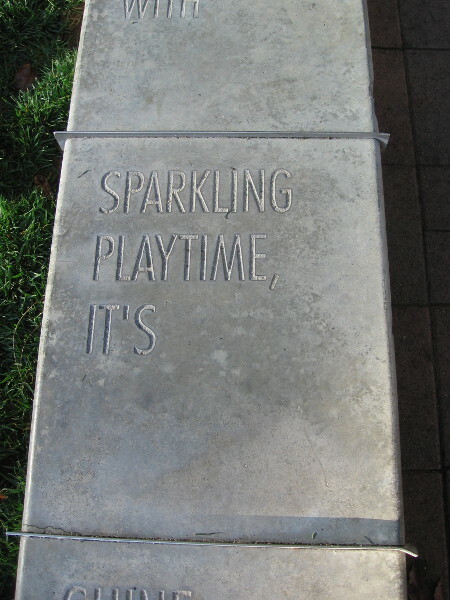 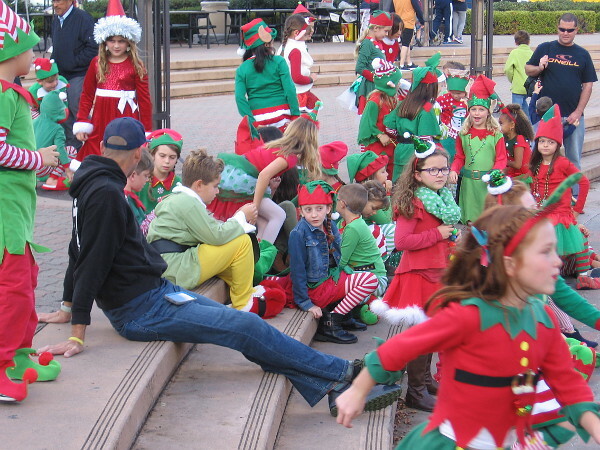 Posted on December 10, 2018 Tags art, authors, books, bronze, children, imagination, inspiration, la jolla, libraries, photo, public art, sculpture, ucsd, writingLeave a comment on Dr. Seuss and Cat in the Hat sculpture at UCSD.